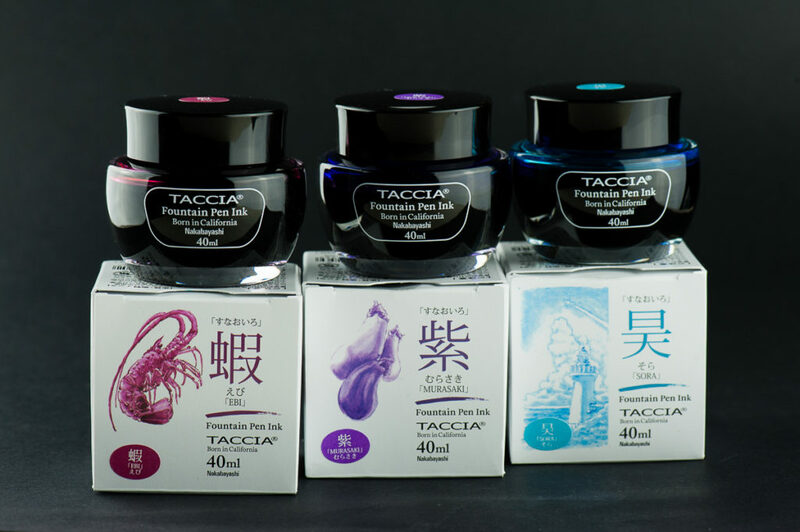 In August 2018, the Taccia Pen Company released their ink line and currently consists of 13 colors. 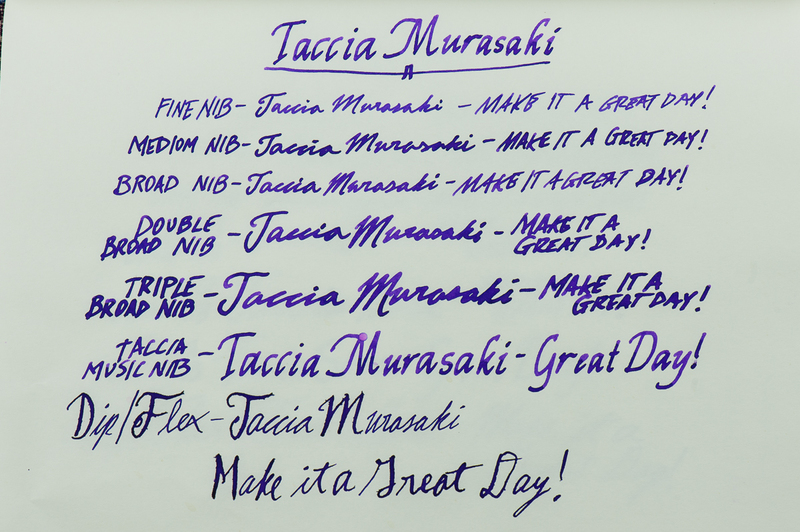 These inks are manufactured in Japan by the Nakabayashi Co., Ltd. At the 2018 San Francisco Pen Show, Taccia brought the full line and had some bottles for sale. 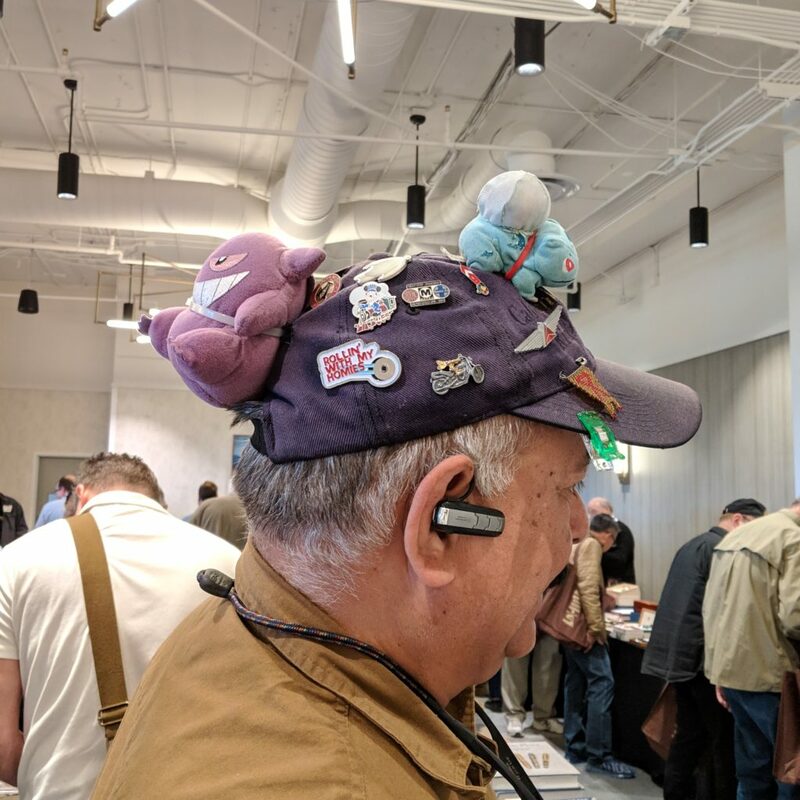 A lot of the show attendees definitely checked them out, HOTP crew included. 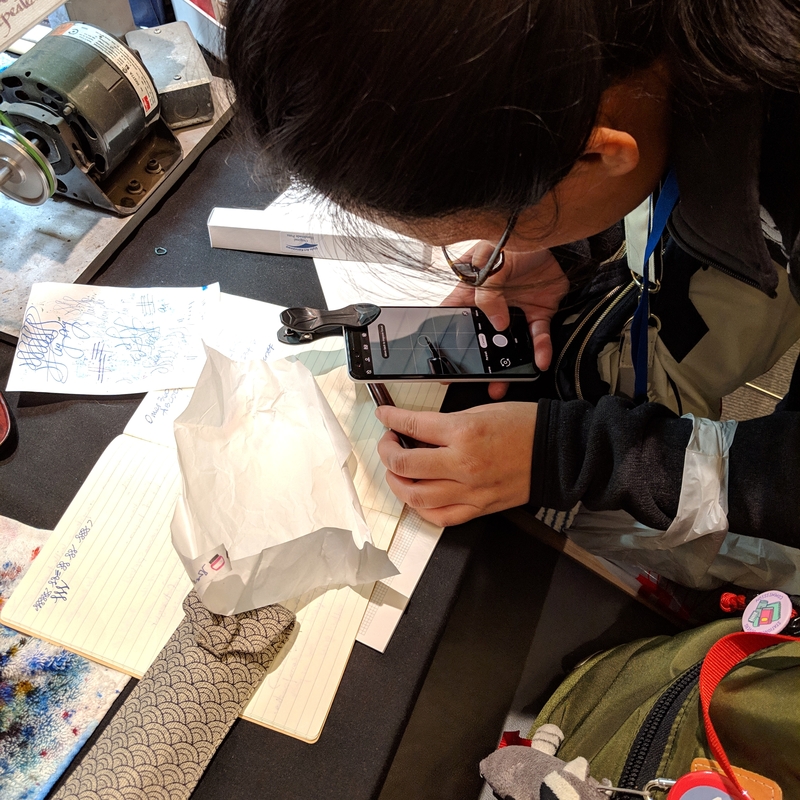 For full disclosure purposes, we purchased the Sora and Murasaki bottles with our own funds and the bottle of Ebi was graciously provided to us free of charge by Ms. Shu-Jen Lin of Taccia. Thank you Shu-Jen! With that, the opinions in this review are always of our own and we were not compensated monetarily for our review. Katherine: I found these inks very well behaved and pretty. I particularly love Ebi, though I thought ebi means shrimp… and this seems like an awfully maroon/purple leaning shrimp. 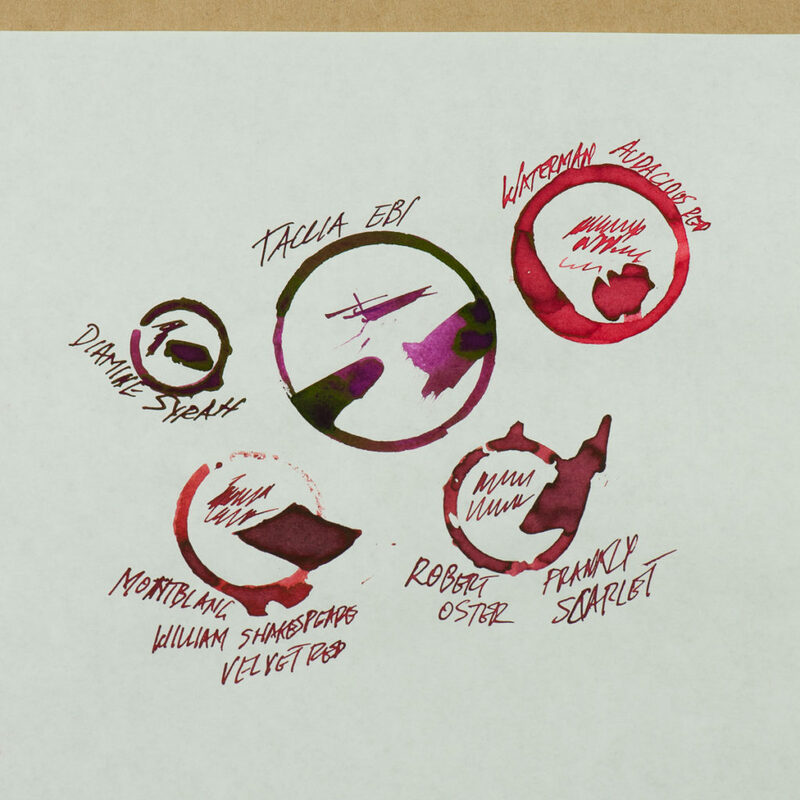 Either way, shrimp are delicious and the ink is a beautiful purple-maroon-pink. 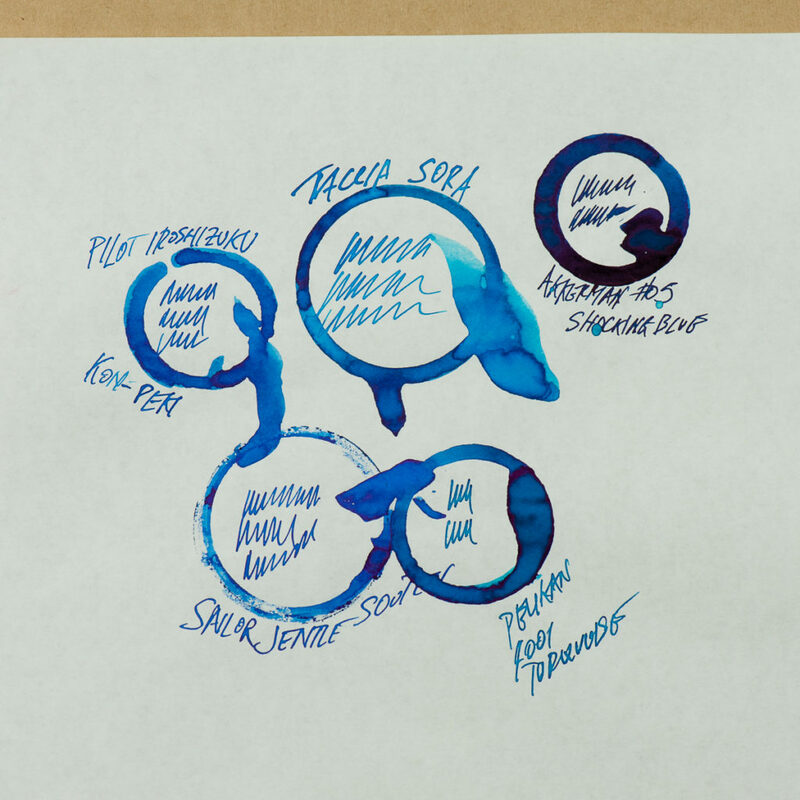 The inks aren’t waterproof, but do have some water resistance, you have to do some repeated wiping (or maybe soaking?) to get them off paper. I haven’t tested this extensively, but I’d be comfortable using this on envelopes when it’s raining (unlike some inks that just waaaaash cleanly off). 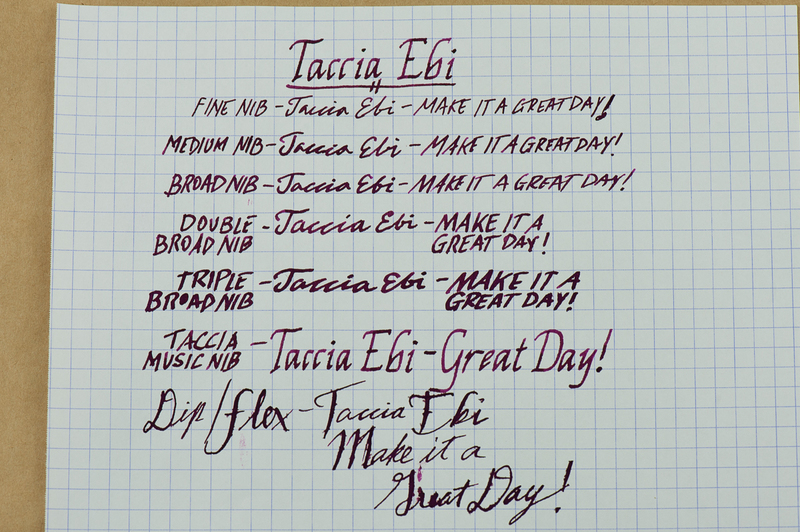 Pam: I am a big fan of the Taccia inks. All three colors are well behaved and easy to clean. No real staining of the hands! I really appreciate the range of colors. My favorite was the Murasaki, the cool purple color. It’s closer to a purple with blue undertones. It is similar to the Colorverse Hayabusa which I greatly enjoyed previously. It does have more shading than the more saturated Hayabusa and doesn’t have the gold sheen. 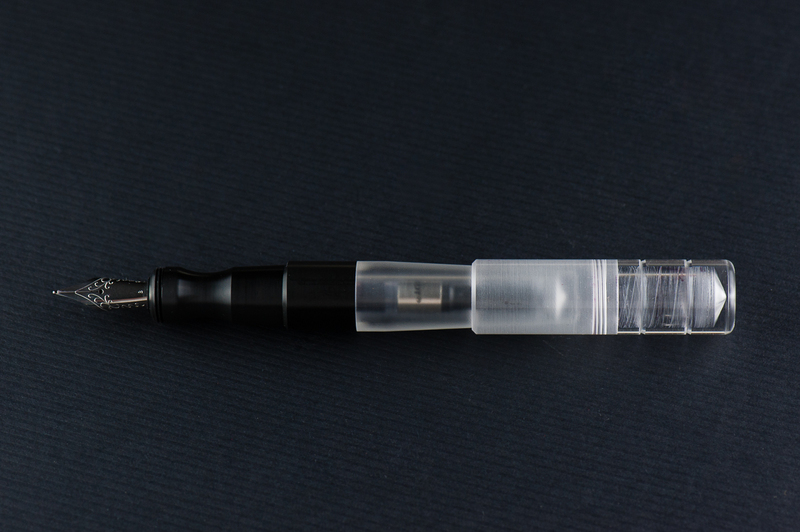 It’s such a well behaved ink and preformed well in all of my pens, although I would recommend at least a Japanese F nib to show off this ink’s color. Broader nibs will show off the shading better. 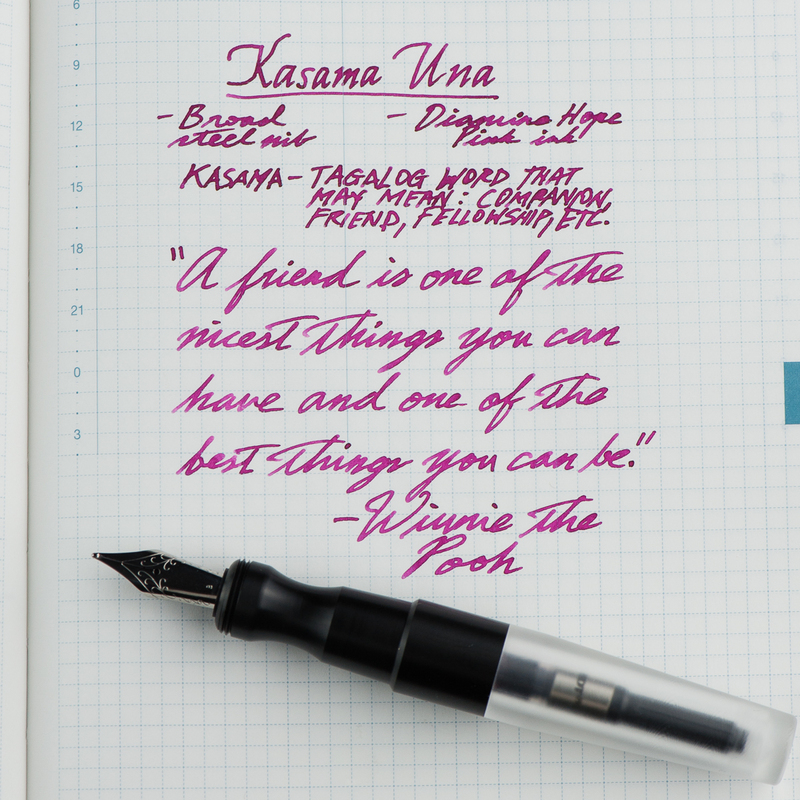 Franz: My favorite of the three inks in review is the Murasaki. The color is in between violet and lilac which provides a feeling of royalty. Or perhaps it’s just me. 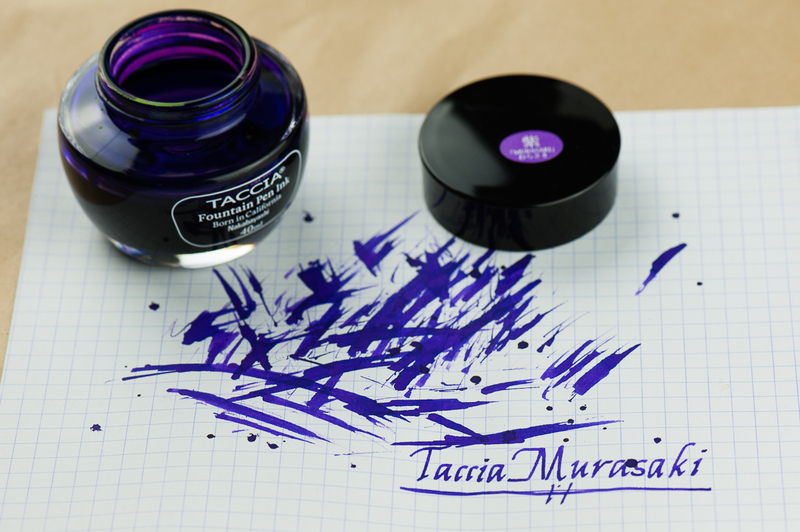 To concur with the ladies above, these Taccia inks are great inks to use and very easy to clean out of pens. Their wetness is at a medium level and has great flow. 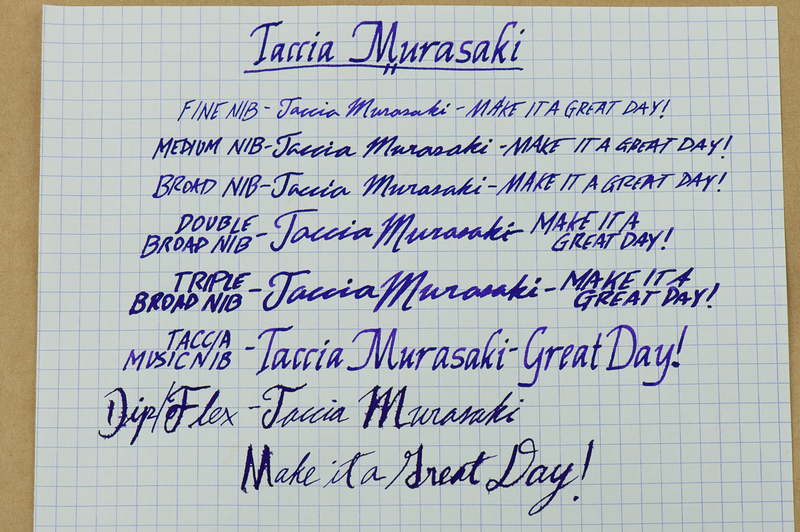 Both the Ebi and Murasaki demonstrated high level of saturation even with a fine nib. 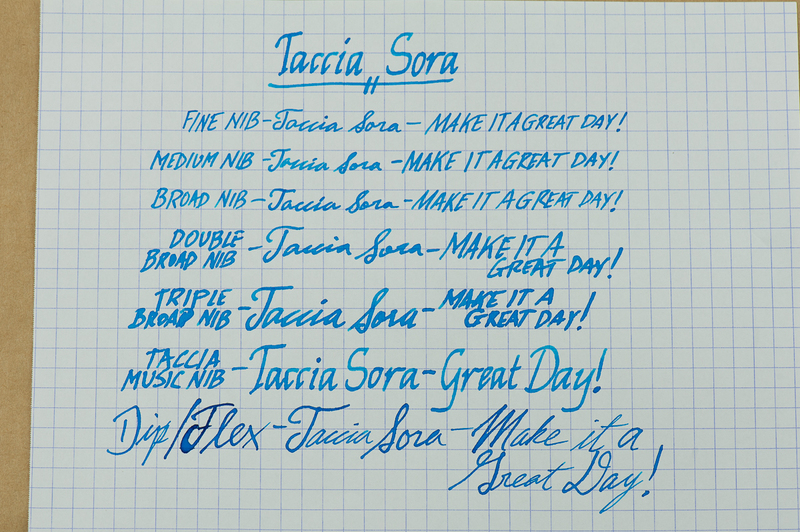 As for the Sora, it maintained its low-to-medium saturation even with a triple broad nib. 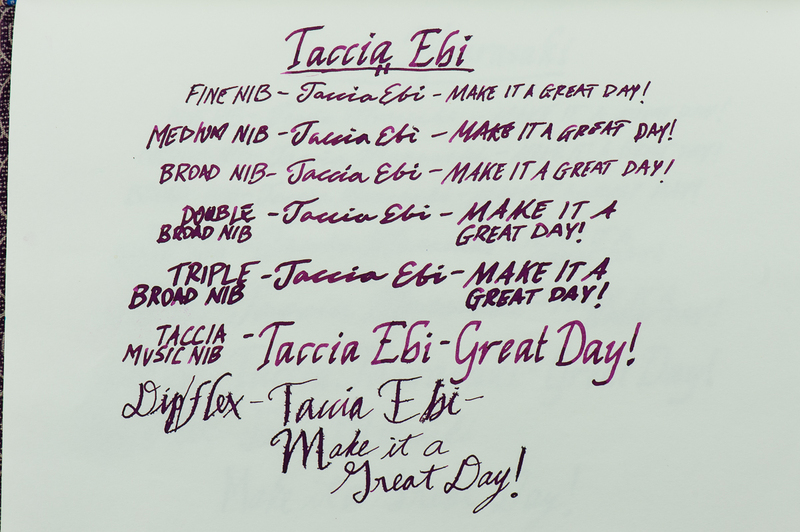 With the dip nib/flex writing, both the Ebi and Murasaki caused feathering on Rhodia 80 gsm and Tomoe River 52 gsm papers. 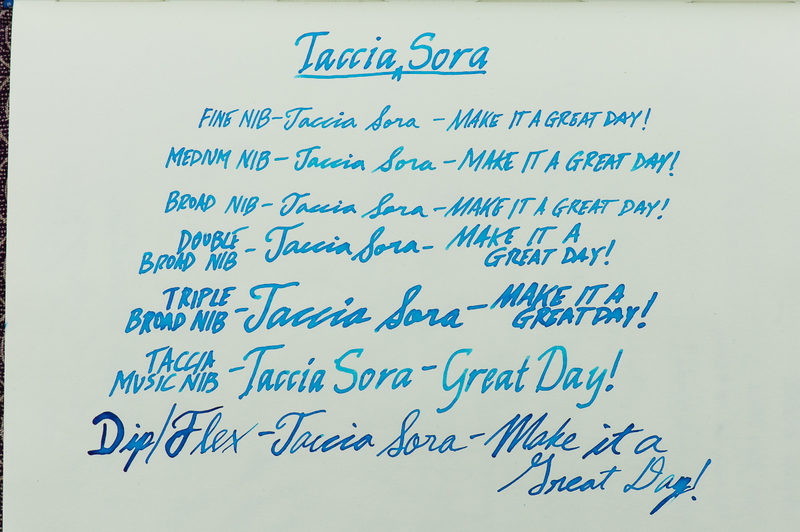 The Sora did not feather at all. 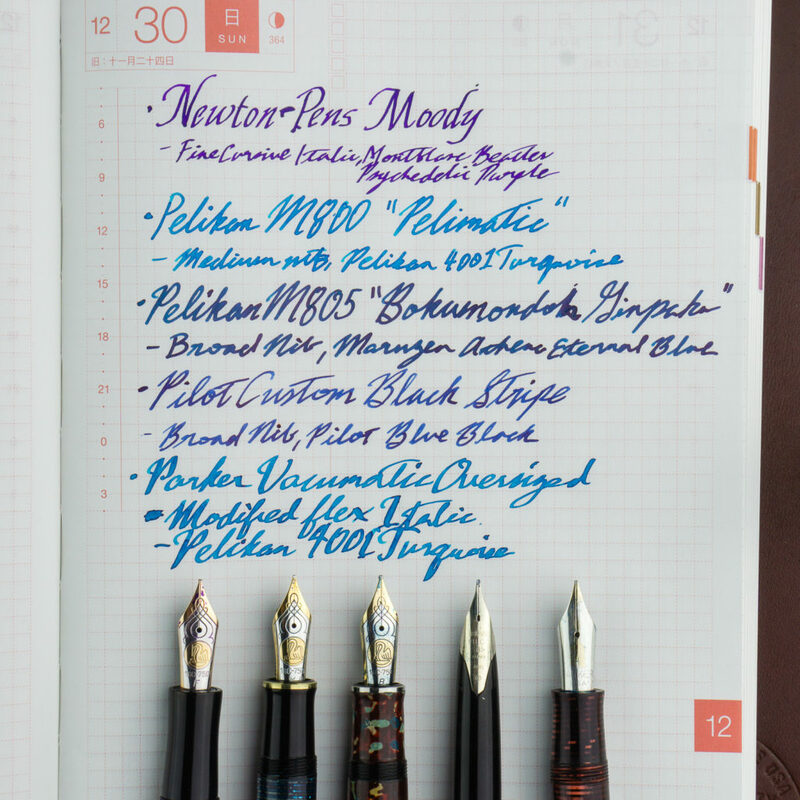 Overall, I was pleasantly surprised to see this new ink brand perform so well. 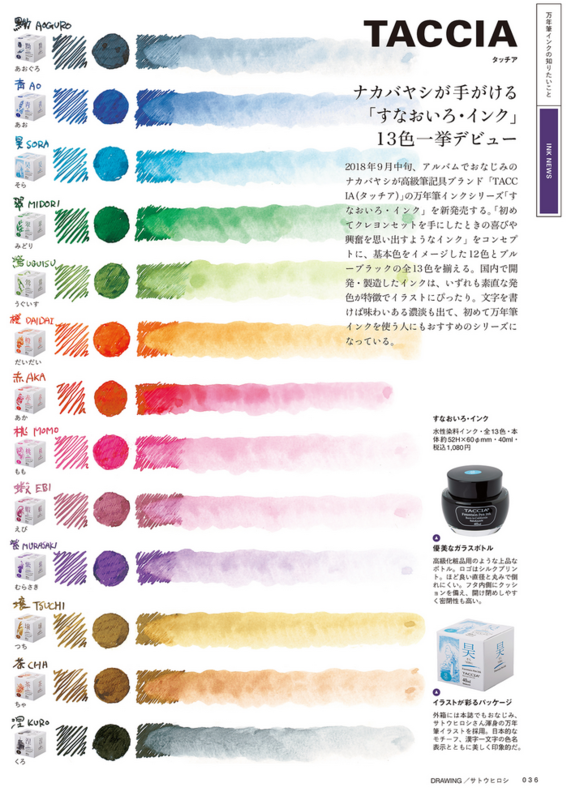 I do recommend these inks for every day use and with the 13 colors, I’m inclined to say that there’s at least one for you. 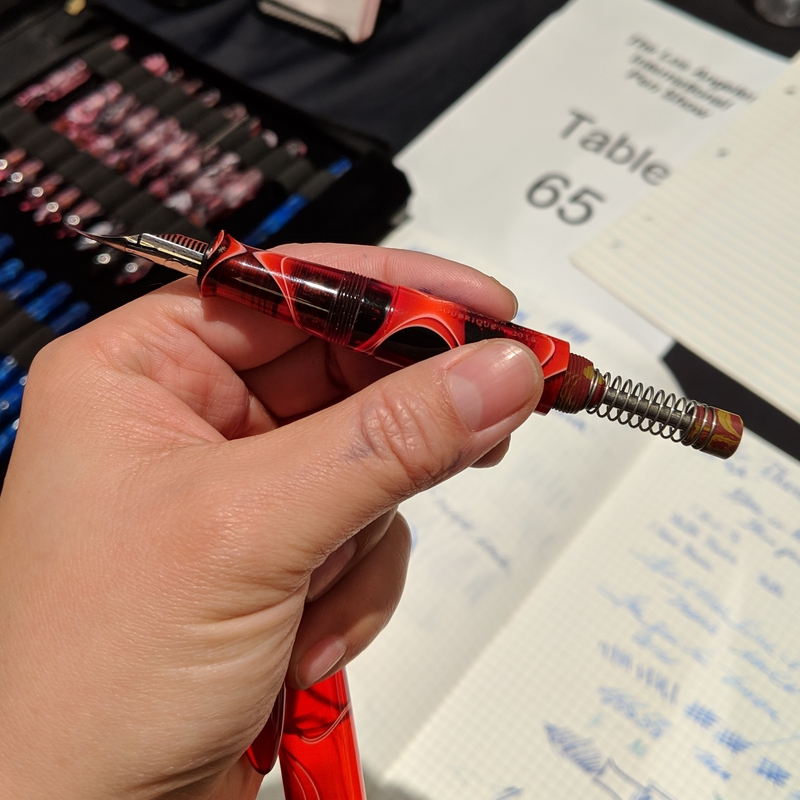 This was my first time attending the LA Pen Show. I’d heard a lot about it (good and bad) and was excited to make the trip. 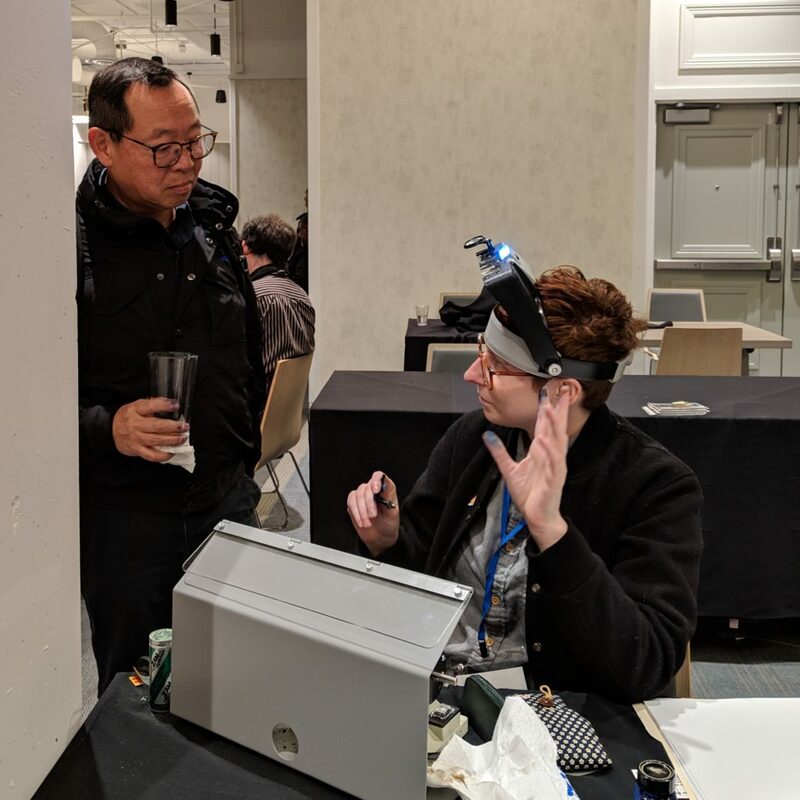 I flew in on Thursday morning, and upon arriving the show hotel, was immediately looking through vendors trays and binders — a great Thursday morning! 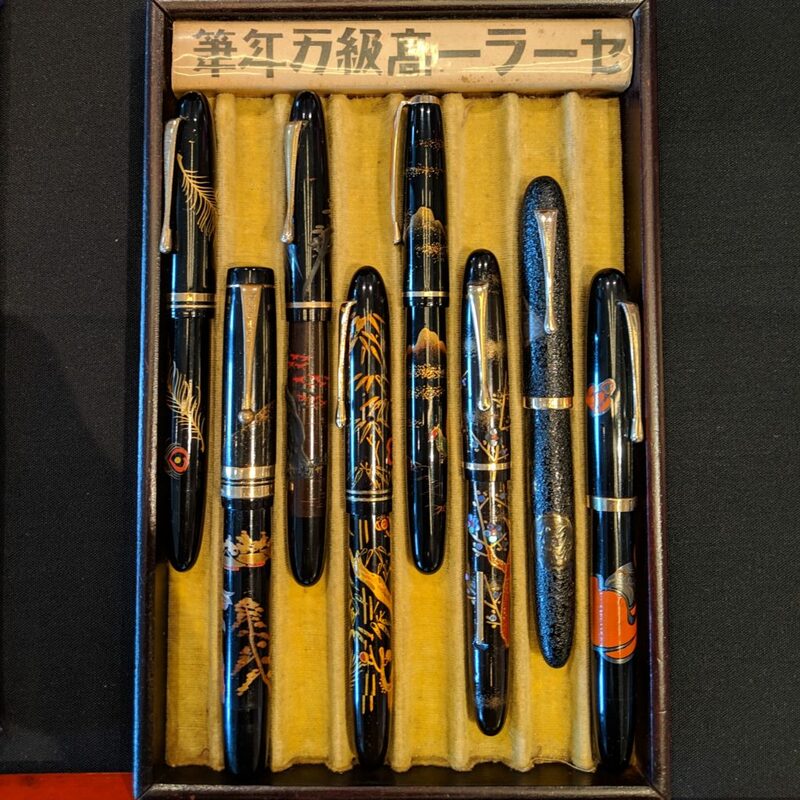 Pen-wise, I went into the show focused on vintage urushi, I don’t see a lot of it in the US, and even at the SF Show, there historically hasn’t been a lot. There are a couple of vendors who only go to LA — so I came to them. And they did not disappoint. 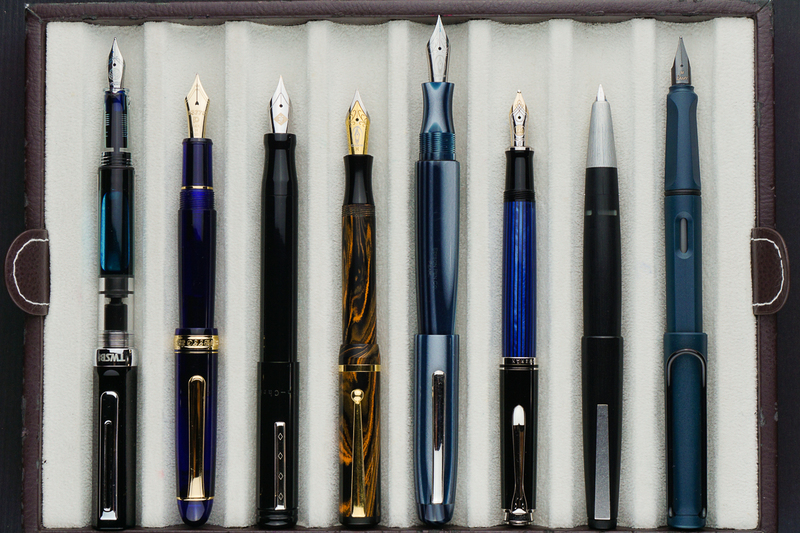 Above is a tray of vintage maki-e, but those weren’t even their “high end” pens. I was severely tempted by this beautiful maki-e cuttlefish. 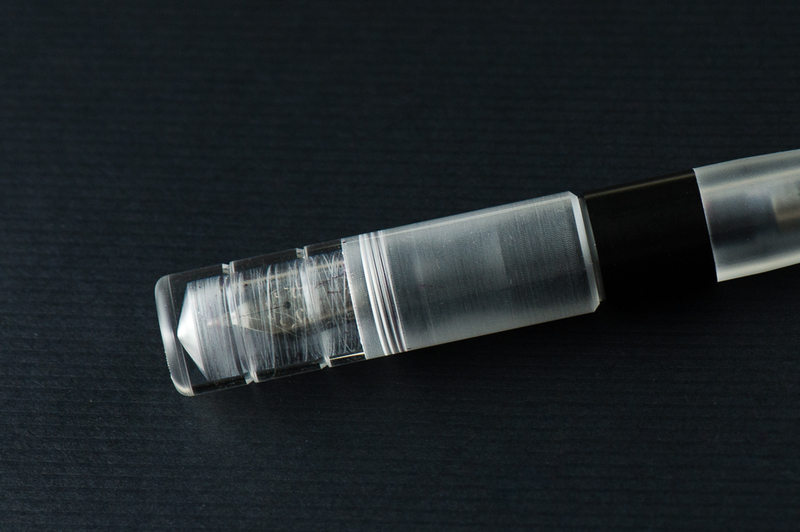 It’s a 1920s hard rubber Japanese eyedropper with modern maki-e, done by a third generation artist. I’ll post a video to Instagram one of these days. This is maki-e on a Platinum 3776, it wasn’t for sale, but look at how cute it is! 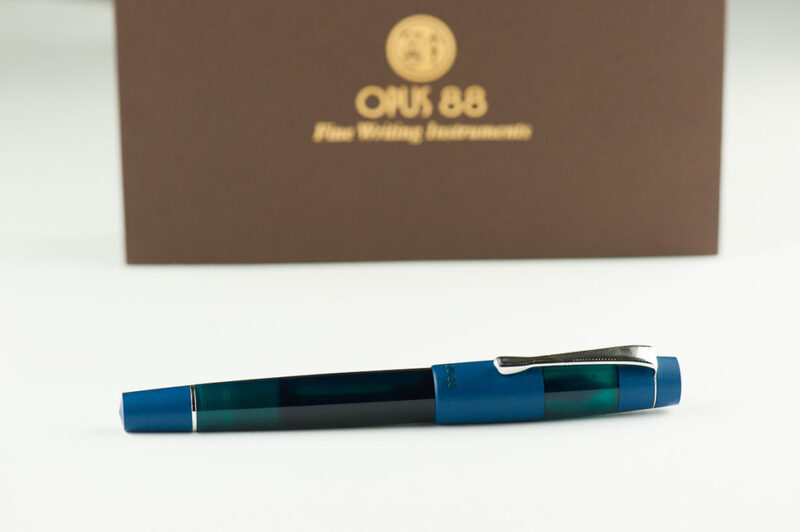 The owner of the pen says that it was done for a pen club in Japan. 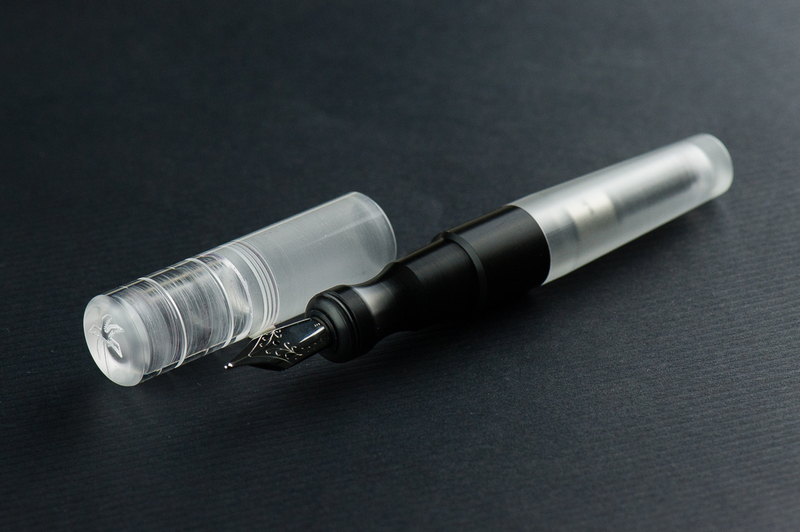 And, before I move on to non Japanese pens, look at this Pilot White Stripe Myu! I’m told the price was on the high side, but nonetheless it sold quickly. I was excited just to see one. 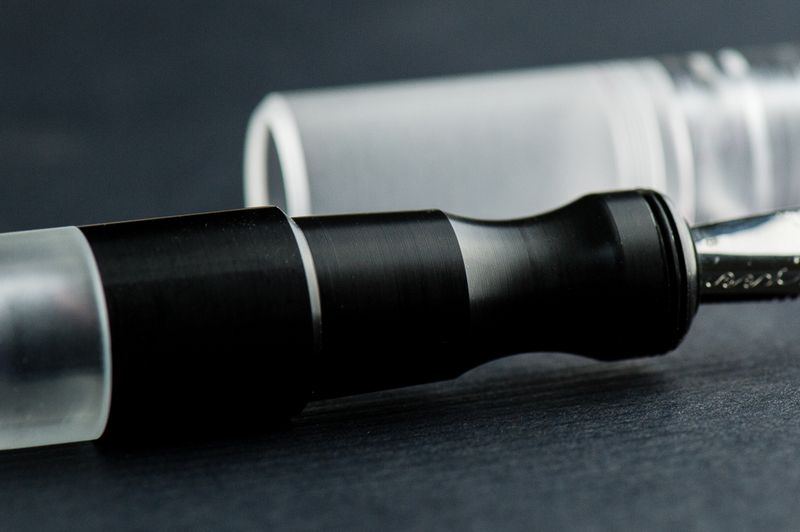 In addition to Japanese pens, there was also Japanese ebonite! I picked up a couple rods for a friend who turns pens. 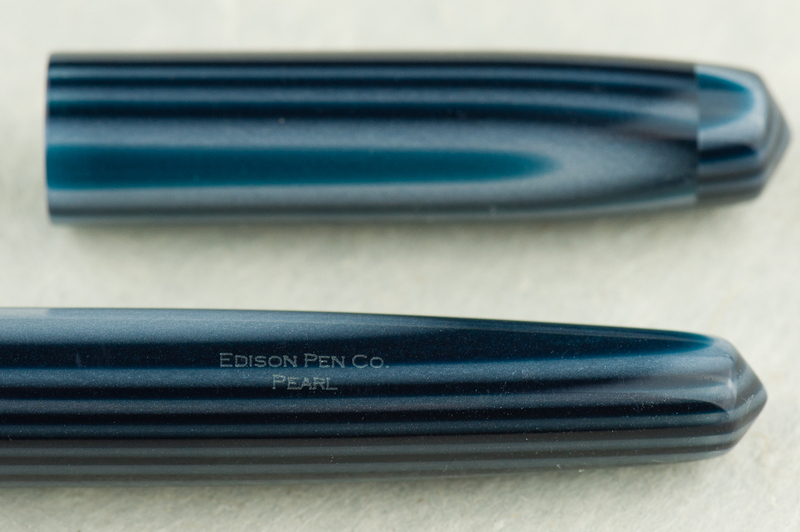 The ebonite was sold by Eboya, who also had their own pens on display — beautiful and simple Japanese ebonite pens. 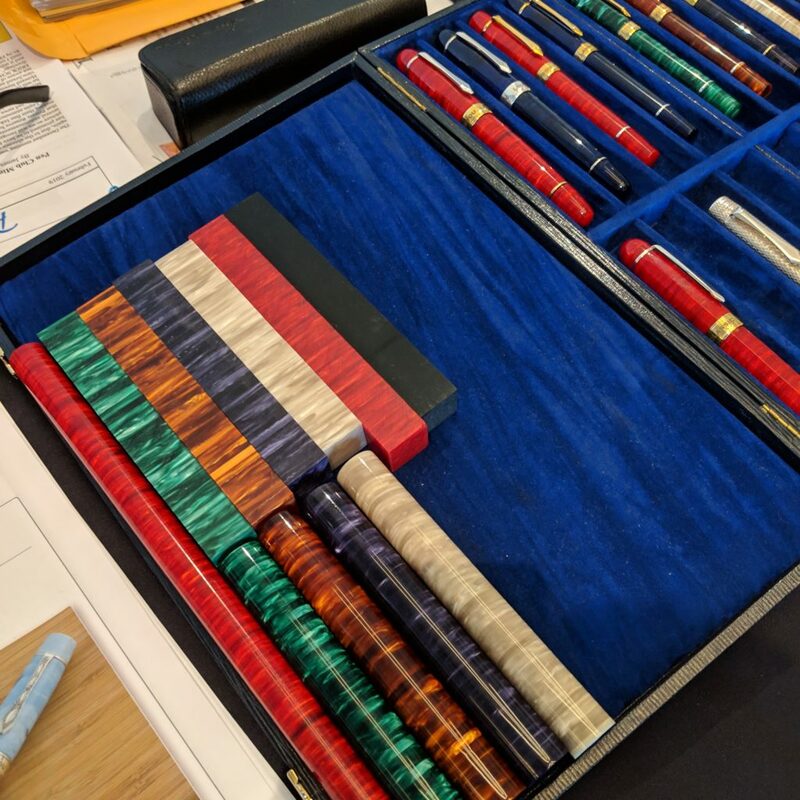 And no show is complete without the stunning materials (not for sale) and pens of Classic Pens. And binders of loose nibs! It’s always fun digging through these. 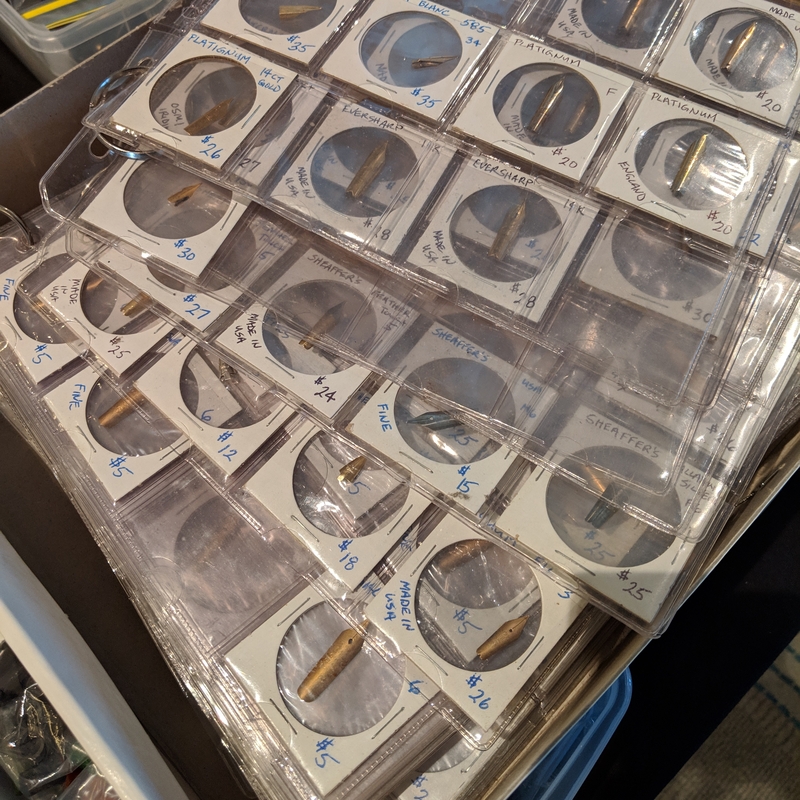 Also, a lot of the vintage vendors had some very reasonably priced flex nibs if you were willing to dig. 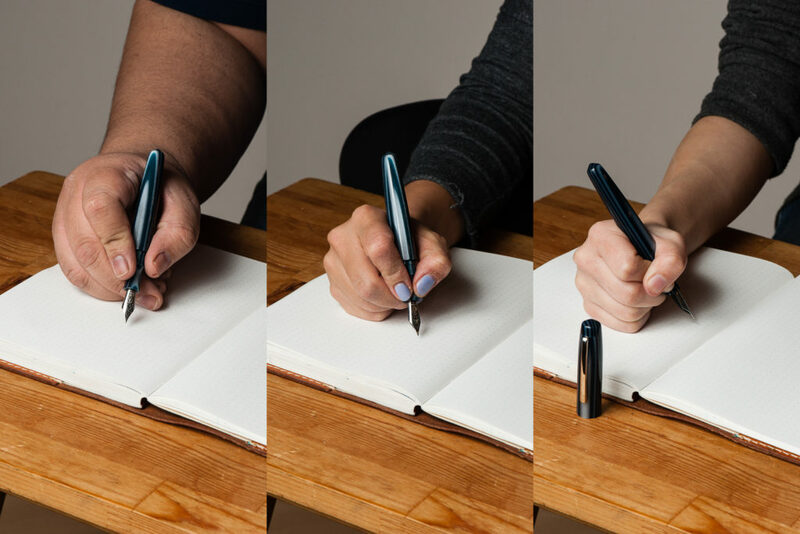 A Montblanc quadruple broad. Wow. I forgot to take a picture of my writing sample, but it’s wider than most of my highlighters. 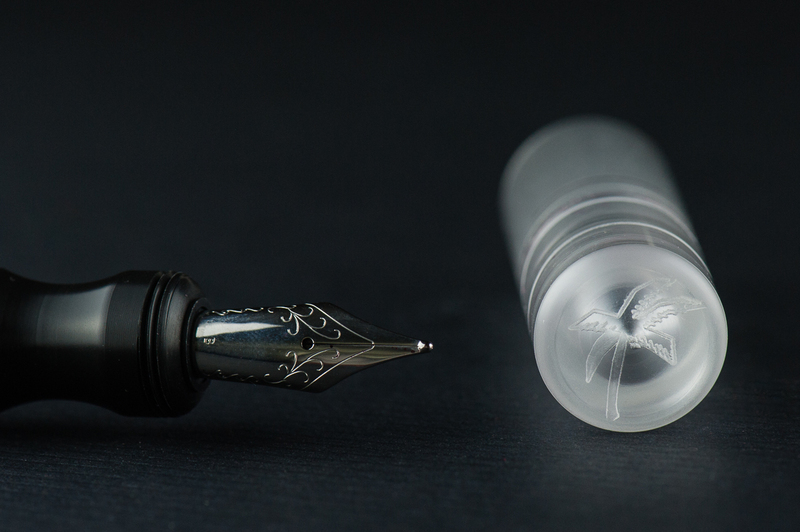 Super cool though I do wonder what people do with this nib other than show it off. And, as expected, there were trays and binders of pens everywhere. I don’t see much LeBoeuf or Chilton online, but there were quite a few at the show. 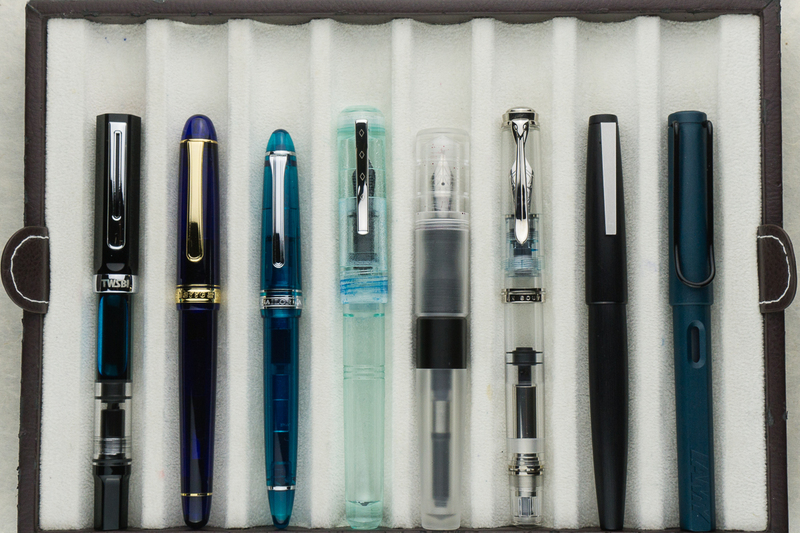 And this crazy tray of custom pens by Rossi, Twiss and maybe some other artists. Wow. 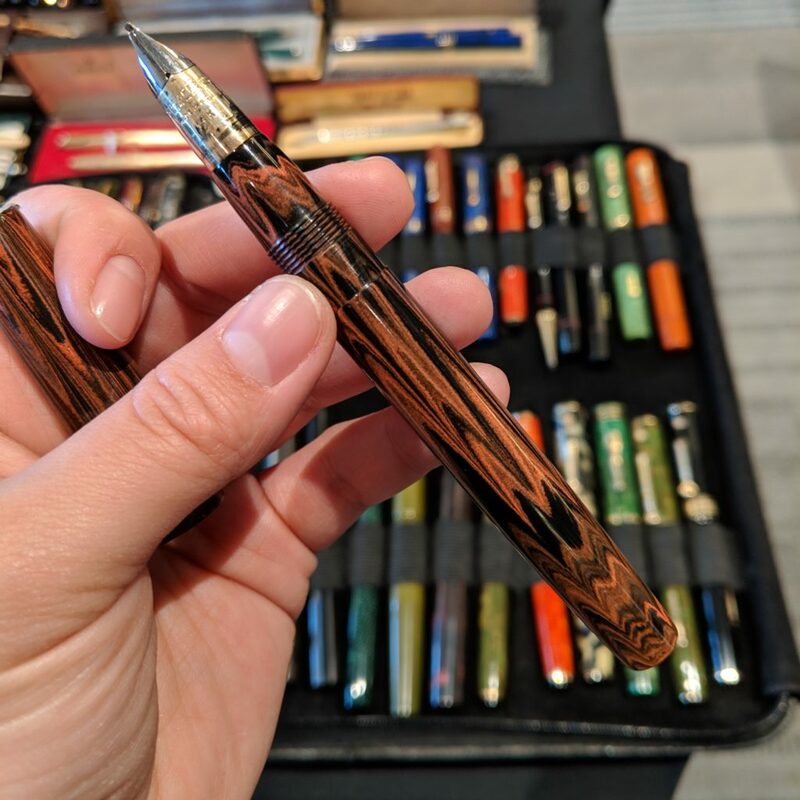 I had a chance to meet Pierre of Desiderata Pens and tried out his pens — very nice! And look at that mechanism, I loved how the pieces aren’t made out of boring black materials. 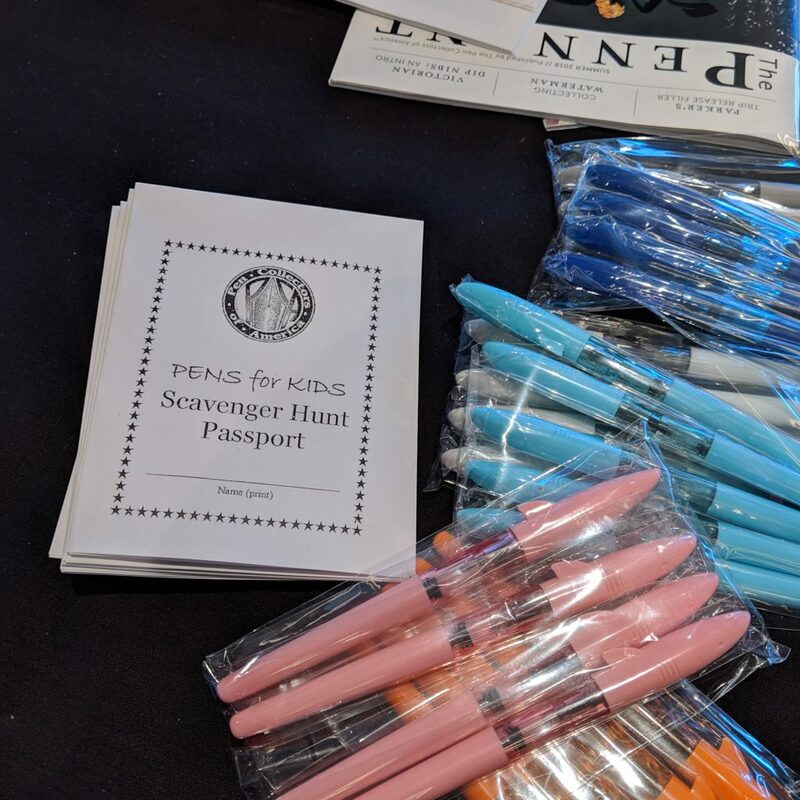 I’m not a kid, but the Pen Collectors of America ran a scavenger hunt for kids — with adorable shark pens! I also (finally) signed up to be a member of the PCA, and picked up my last year’s worth of issues. 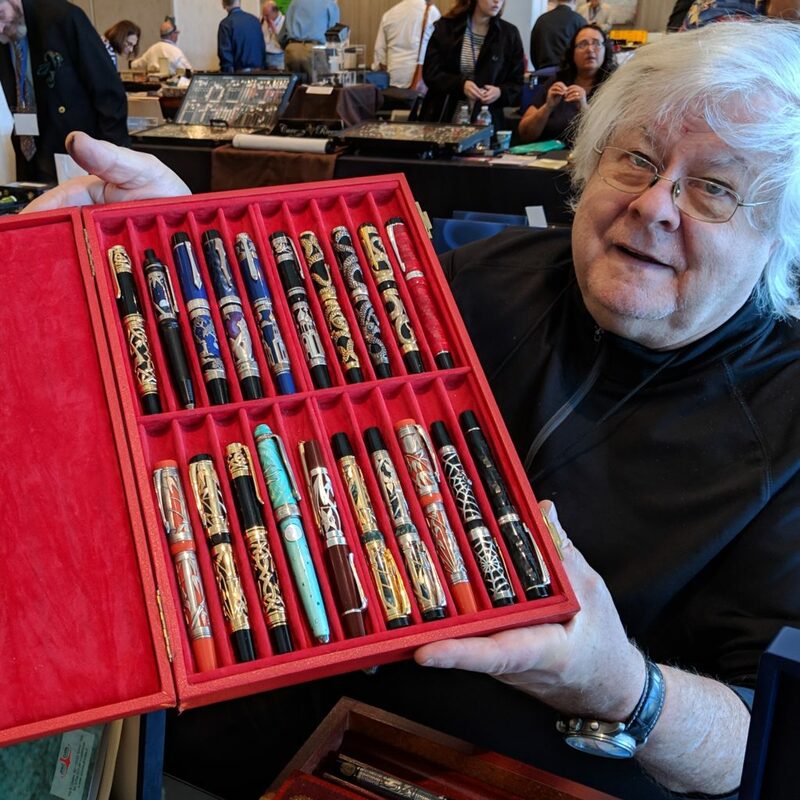 It made for great reading on the way home, especially the chart on what to look for when shopping for Waterman pens, including size ranges and prices. I was also lucky enough to get grinds from both Masuyama (left) and Gena. Gena is new to the show circuit — she used to do many of the inhouse grinds at nibs.com, but has recently branched out on her own. Review to come! And here’s a friend trying to photograph the “super sharp” italic Masuyama put onto a Vanishing Point. He suggested that we try cutting paper with the edge of the nib. Speaking of friends… I got to meet so many internet pen-friends! It’s always great putting faces to names, and going to a show other than SF means there’s a whole new set of folks to meet! And some people who you don’t get to make friends with, but are awesome anyway. 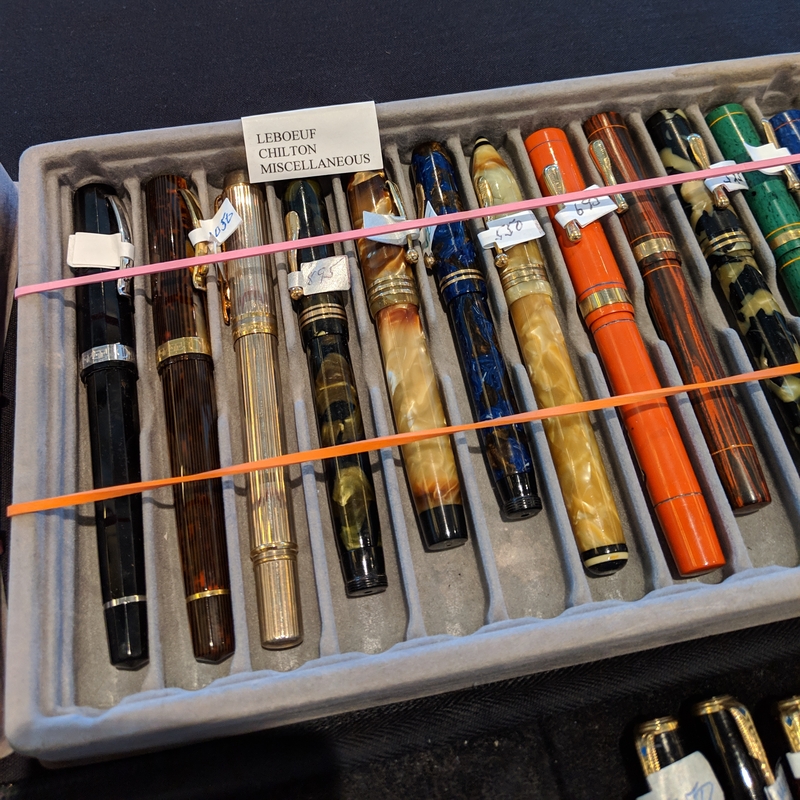 All in all, I had a great time — it was my first time traveling for a pen show, and I’d definitely do it again. 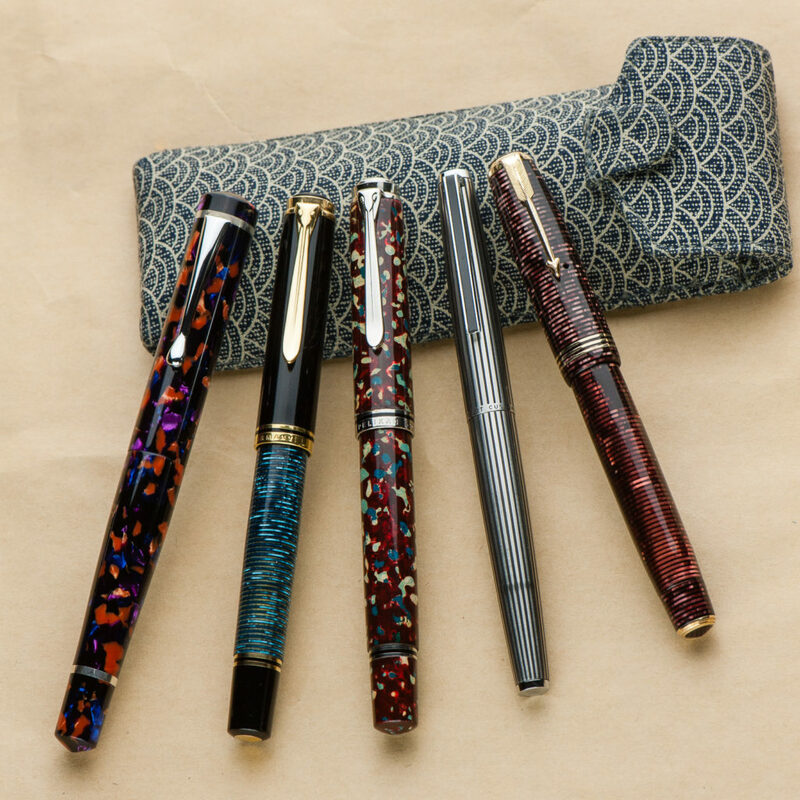 LA has a very strong vintage pen community, and an unparalleled selection of vintage Japanese pens. However, as many others have said, it isn’t the smoothest show logistically. And here it is about 30 minutes after opening. 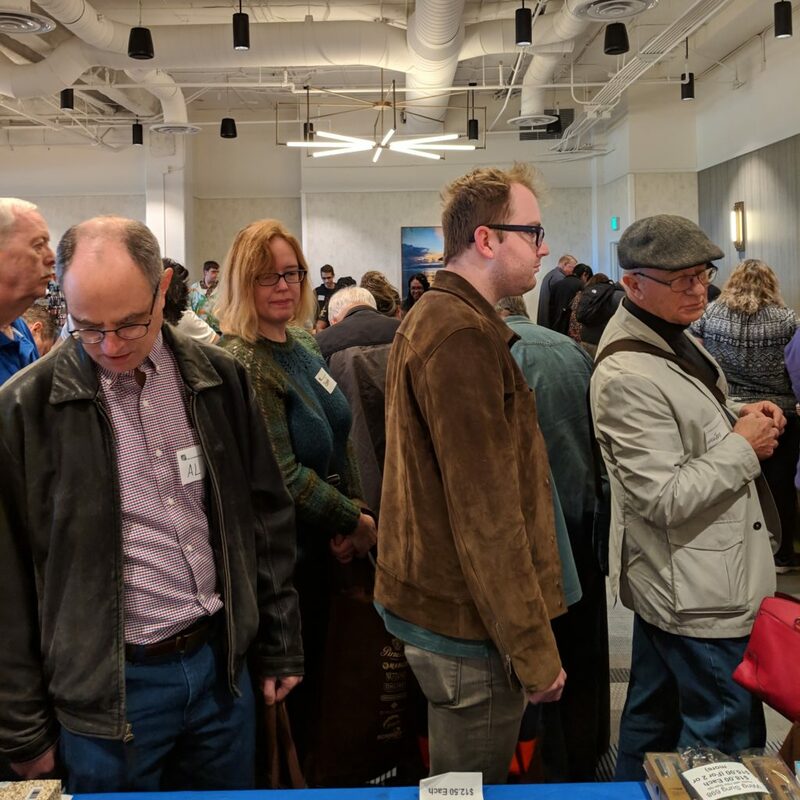 Sunday was packed — there was barely space to walk through the aisles for a few hours, and a handful of thefts were reported. 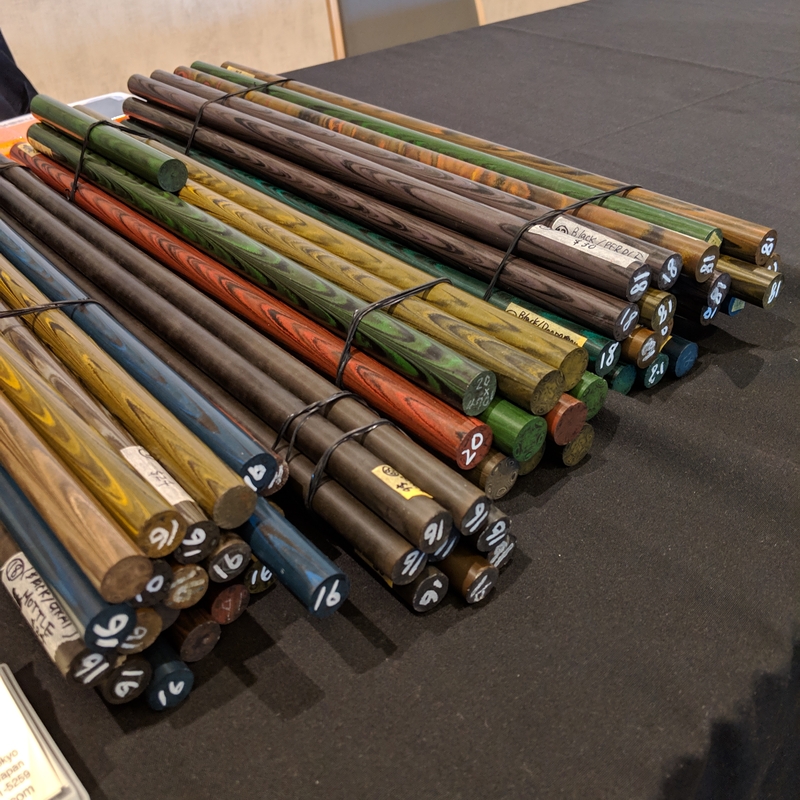 I don’t imagine any vendor can keep an eye on all the pens on their table. For next year, I’ll likely attend the LA Show again, but totally skip Sunday if the schedule and fee structure stays the same. My wallet barely survived, but I had a great time. I saw a huge variety of pens, ate some great food, hung out with friends new and old and even bought a few pens. P.S. Another post to come on my haul. Pictures still need to be taken. While taking a shower and considering which pens would make the cut for my “Top 5” for 2018, I realized that I’ve gone pretty deep on a couple new (to me) makers/brands this year. It’s about time I branched out! 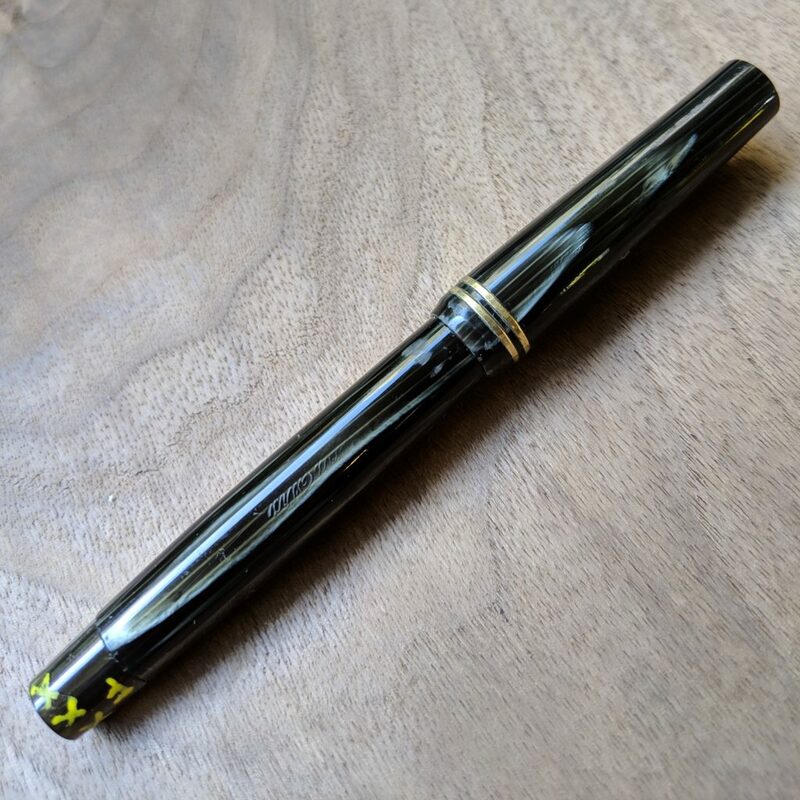 It’s well known in the addict enthusiast community that I’m a bit Nakaya obsessed (see our 2017 Wrap-up for proof) so I’m excited to be diversifying. 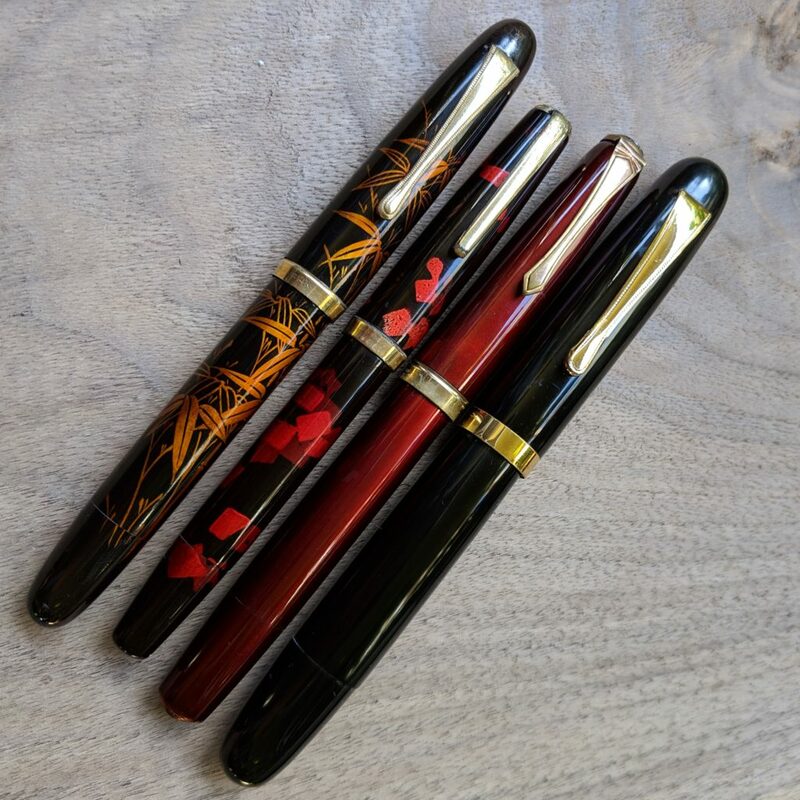 The three I have are all in the “Asama” shape, the only one available for most of the urushi finishes. 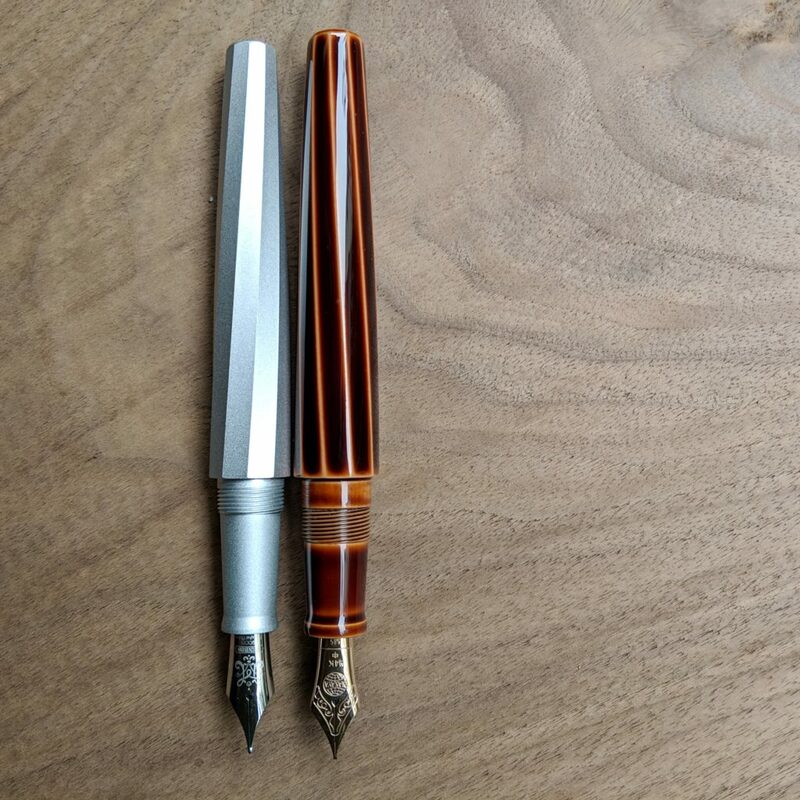 All three are fitted with Pilot #15 nibs, an FA, WA and PO from top to bottom. The Pilot nibs (and Kazuno-san’s tuning) make them all fantastic writers. 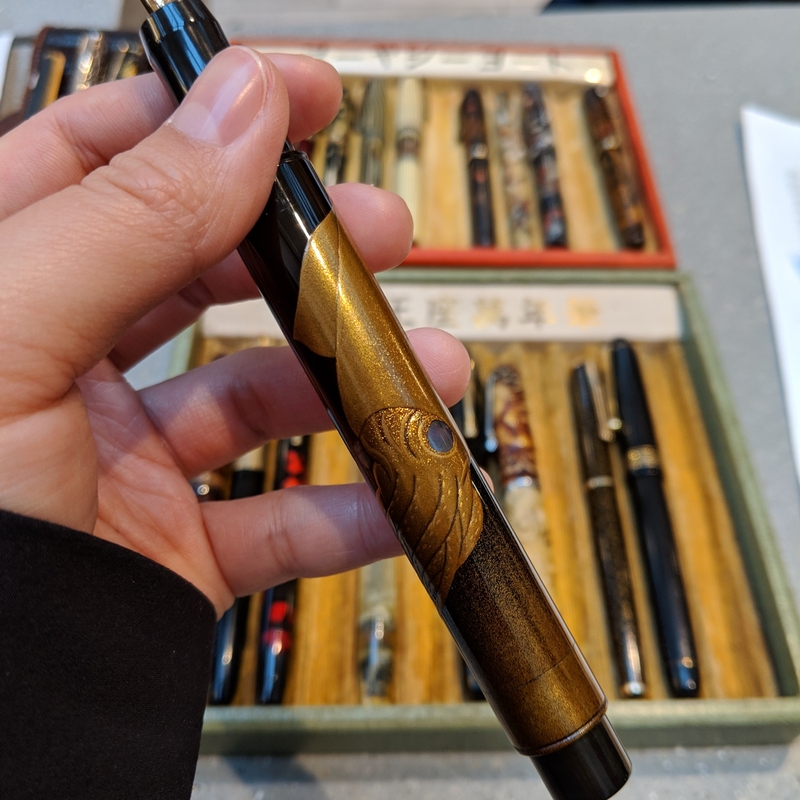 Paired with unique and gorgeous finishes, what more could an urushi fangirl like me ask for? 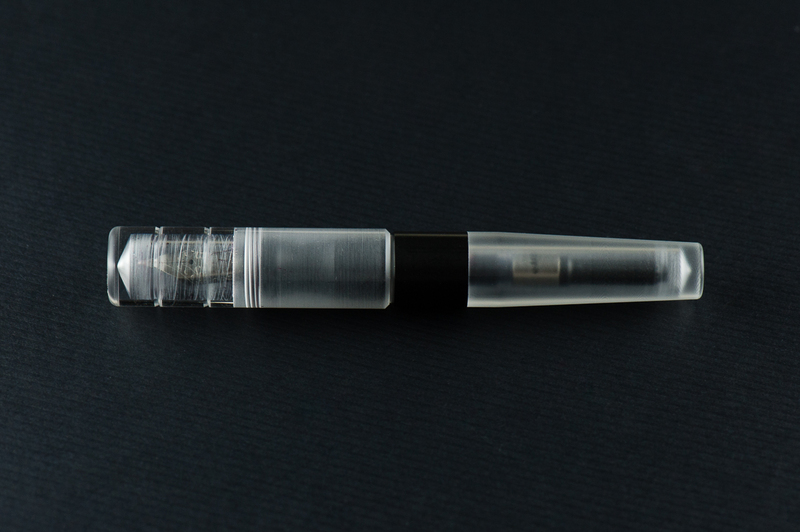 Like the Stylos, I’d admired the Kasama pens before I owned one, but… also before Kasama became a brand. I’d seen a handful of prototypes during a FPN-Ph mini meet and loved the chunky, short shape and the interesting materials. Several months later, Kasama was born and my brother gifted me my first one for my birthday. 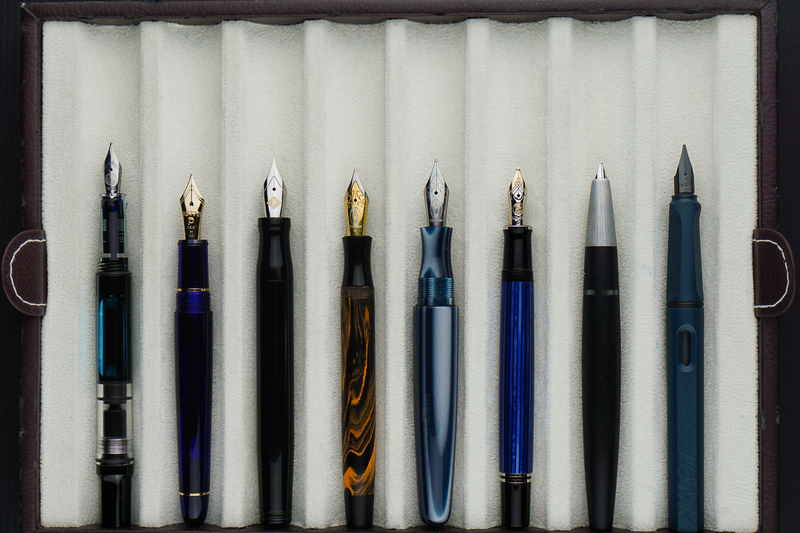 I tend to prefer the look of short pens, and the Kasama Una (the shape of all their pens so far) is short, but not narrow. To make matters worse, they’ve continued to experiment with models and color combinations… so I constantly find myself fighting the urge to collect them like Pokemon. (I’m not sure I’m winning) And, of course, it doesn’t hurt that they’re made in the Philippines — I love the idea of putting my thoughts to paper with an implement that is hopefully the start of a new niche, craft and tradition in my (kind of) home country. Urushi Studio Bokumondoh is made up of a single artist, Hiroko. 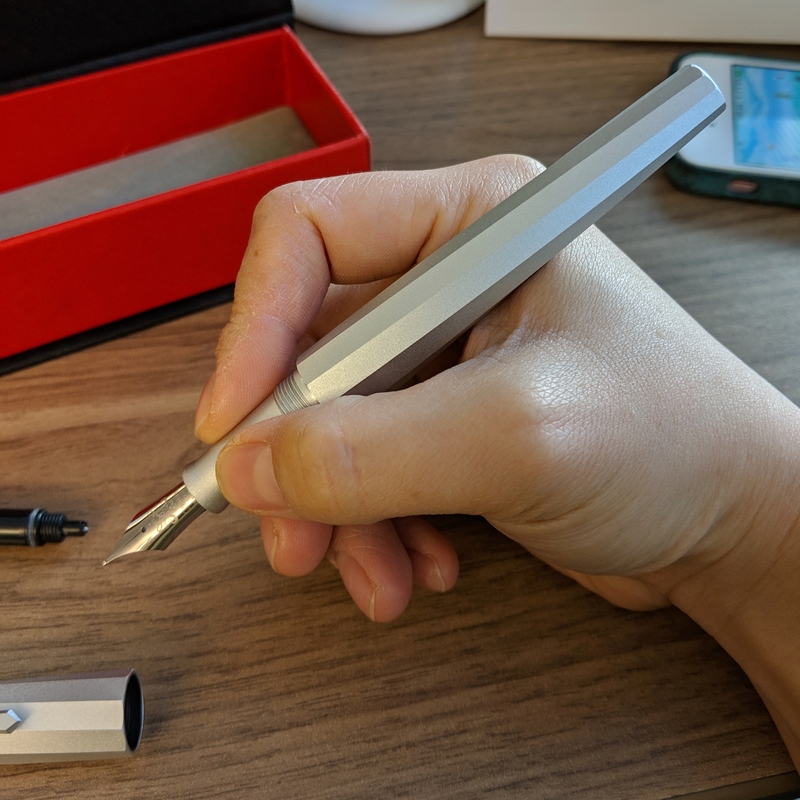 She’s not a pen person herself, but she’s more than happy to do custom urushi work on pens you send her (the one caveat is that she can’t get under a clip, so either send pens with removable clips, or pick a design that leave the clip area plain). 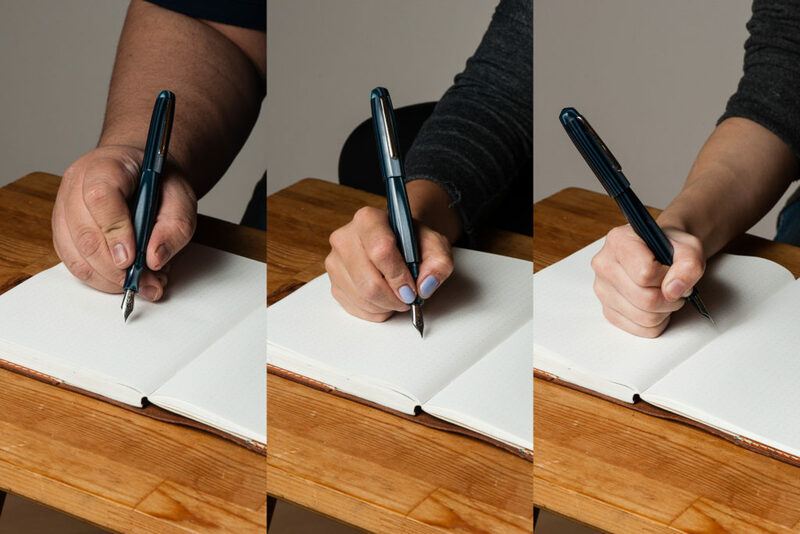 For my first order, I sent her one pen, for my second, I sent four. What did you discover in 2018? What are you excited to carry forward into the New Year? Franz: Another fantastic year has come and gone and 2018 has been an interesting year for me in terms of refining my pen focus. I believe I can categorize this year as both the Custom/One-Off Exploration, and the Vintage Search/Education type. I’ve actually bought less pens this year against any other year however it has been more deliberate and selective. This may be an influence from Katherine. Haha! 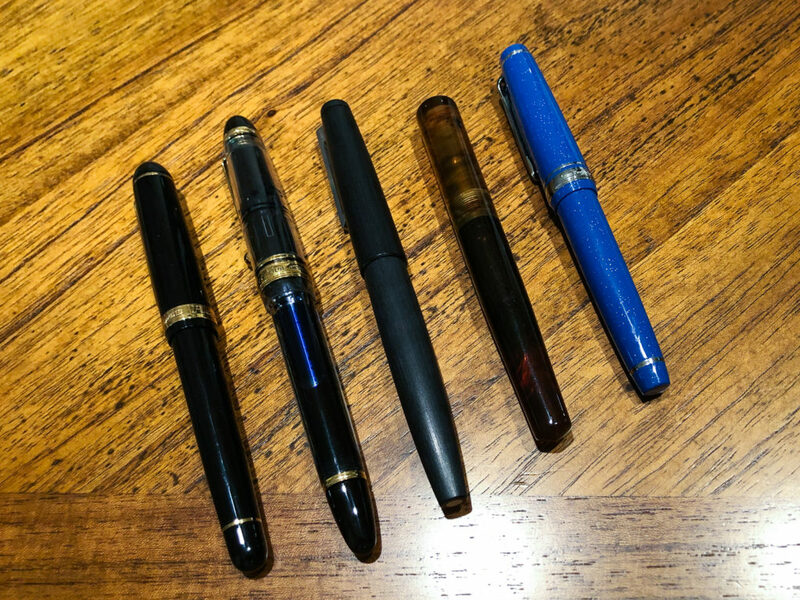 And here are my Top 5 Pens for 2018. This isn’t my greatest pens of all time however these are the pens that have been acquired within the year and has been inked up ever since I got it. Also a quick note, one of my invaluable stationery finds for the year is the Musubi pen case (pictured above). This has been a daily carry case for me at work and it secures my pens well. 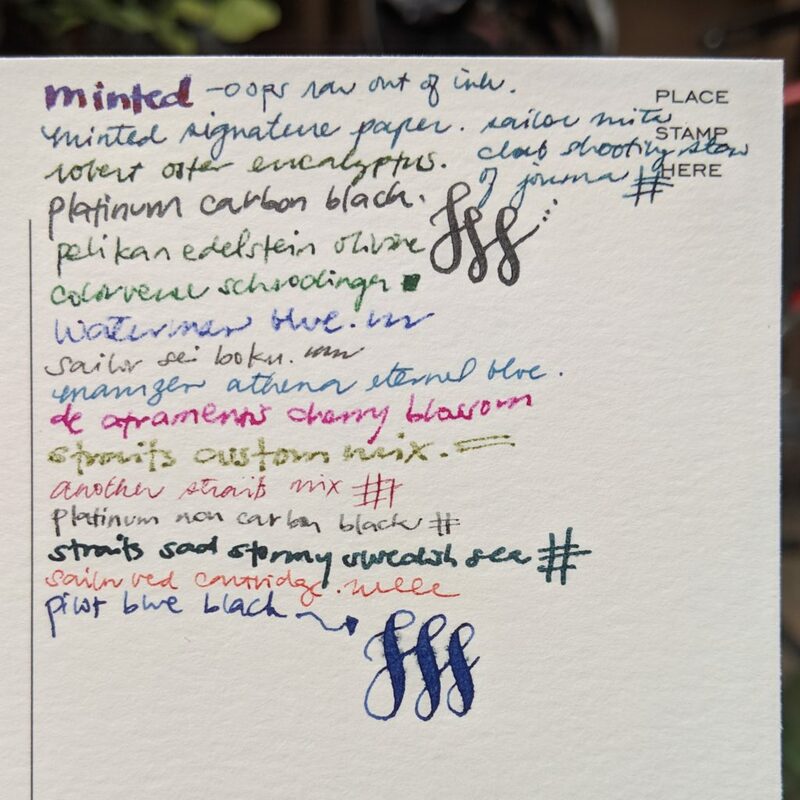 Newton Pens Moody (Fine M800 Cursive Italic Nib) – I got the chance to be on Shawn’s wait list and it took me a while to figure out what I wanted. 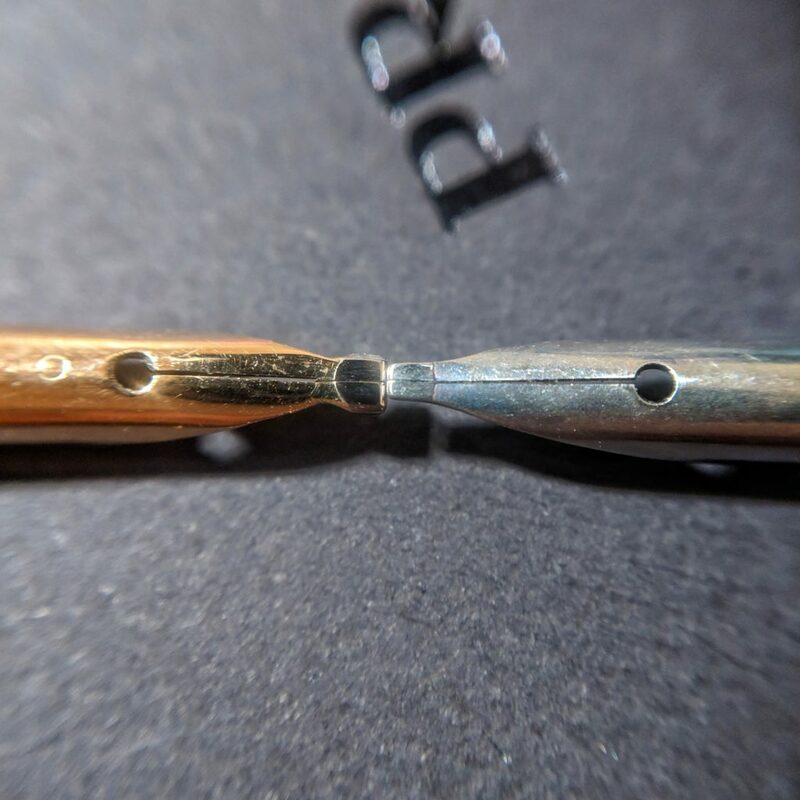 I supplied the M800 nib to Shawn, I asked him for a longer section, and also found this fantastic material. I got this early on in the year and it’s been a favorite ever since. 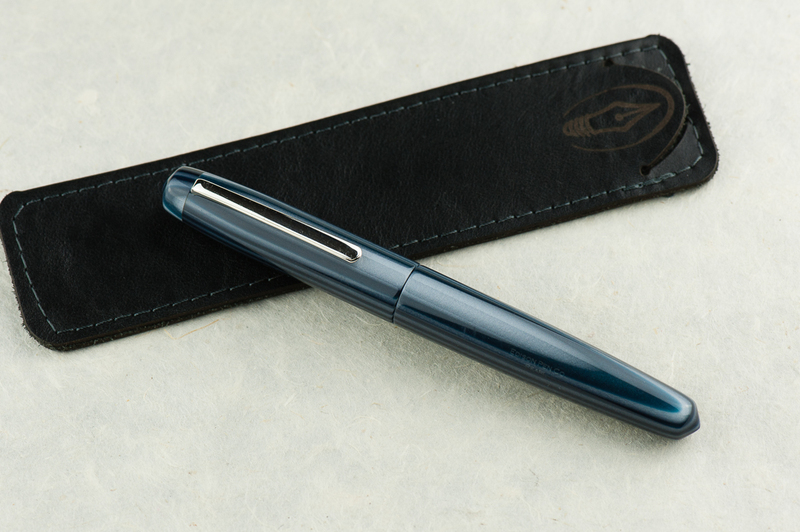 Pelikan M800 (Medium Nib) – I got this from the LA Pen Show from one of the trusted vendors. 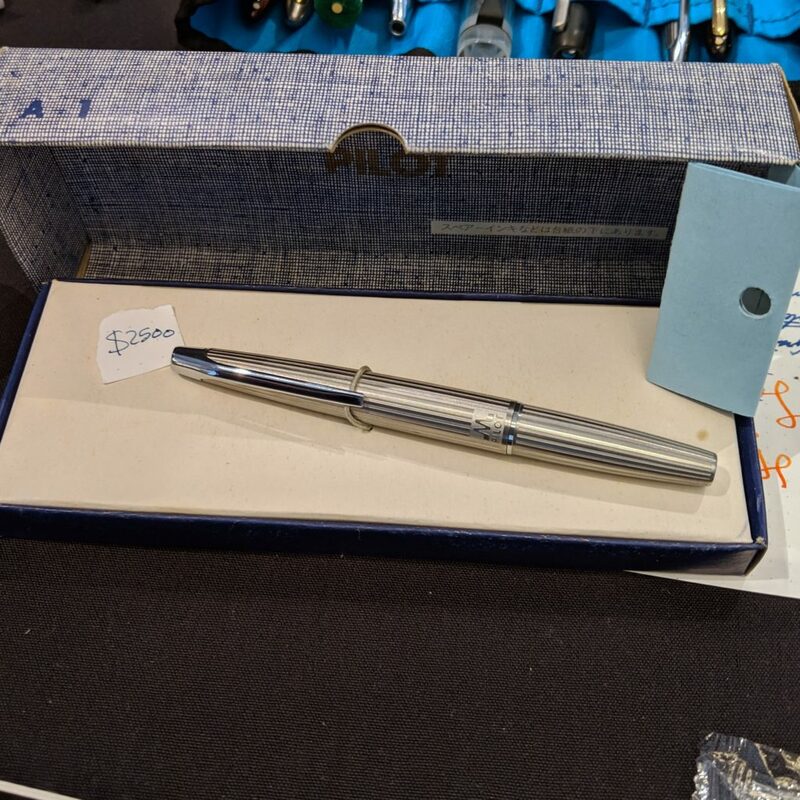 He said that this was a one-off and it took a long time for him to decide on selling this pen. He dubbed it “Pelimatic” even if the material in the binde used was from a Visconti Wall Street celluloid. I found it on Thursday night but I did not buy it until Friday afternoon. So I know that this pen was for me. 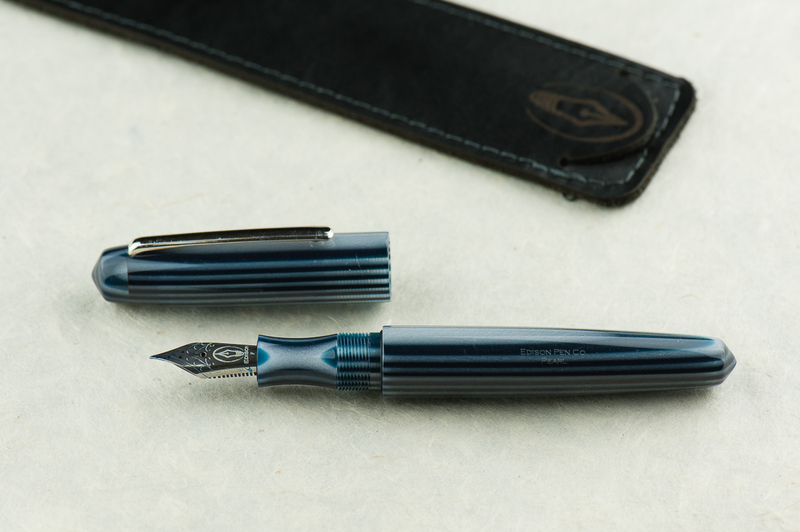 Pelikan M805 (Broad Nib) – This is sort of a cheat. This pen was a Black M805 and has been with me since 2014. 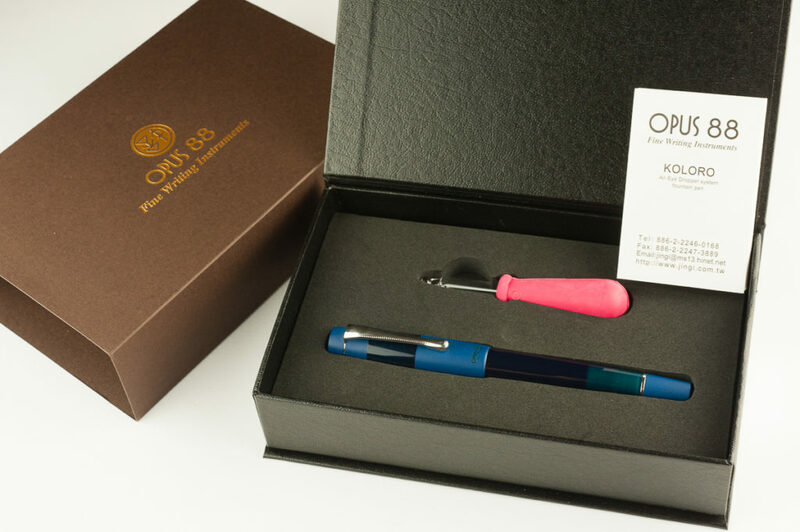 However this year, the pen took a trip to Japan around September and came back in November with new clothes! 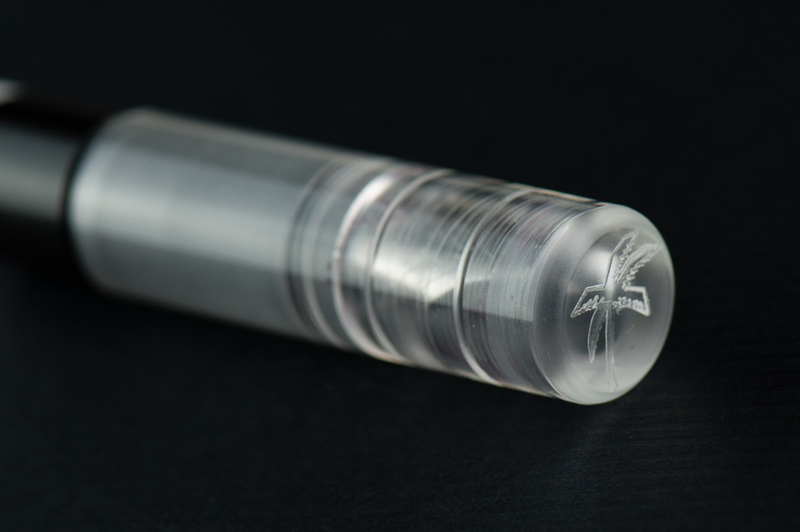 =) The entire barrel and cap was customized with urushi lacquer by Hiroko of Bokumondoh. 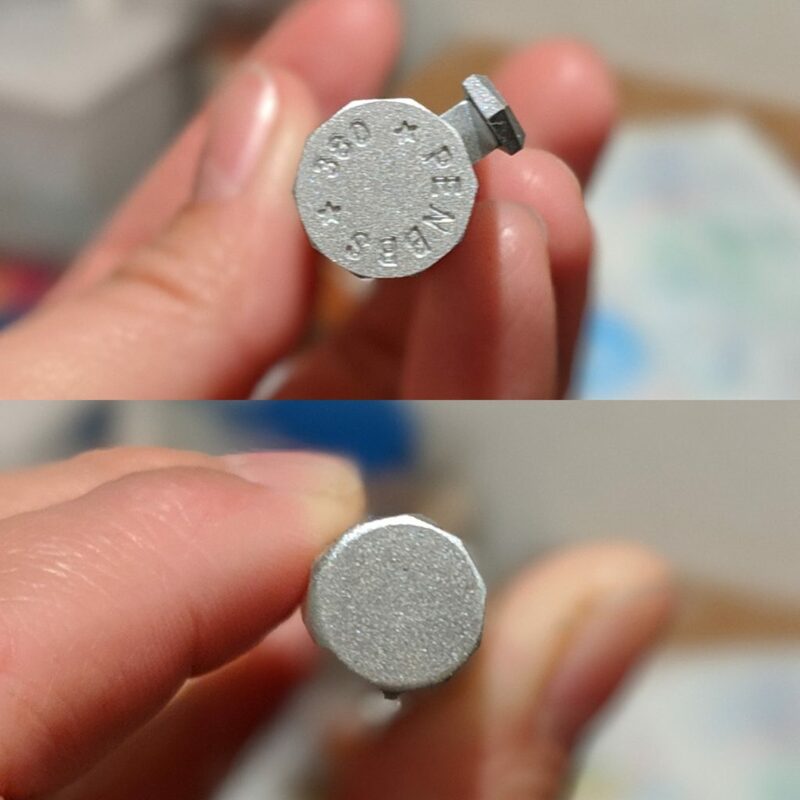 The technique/finish is called Ginpaku (silver leaf). I love everything about it! 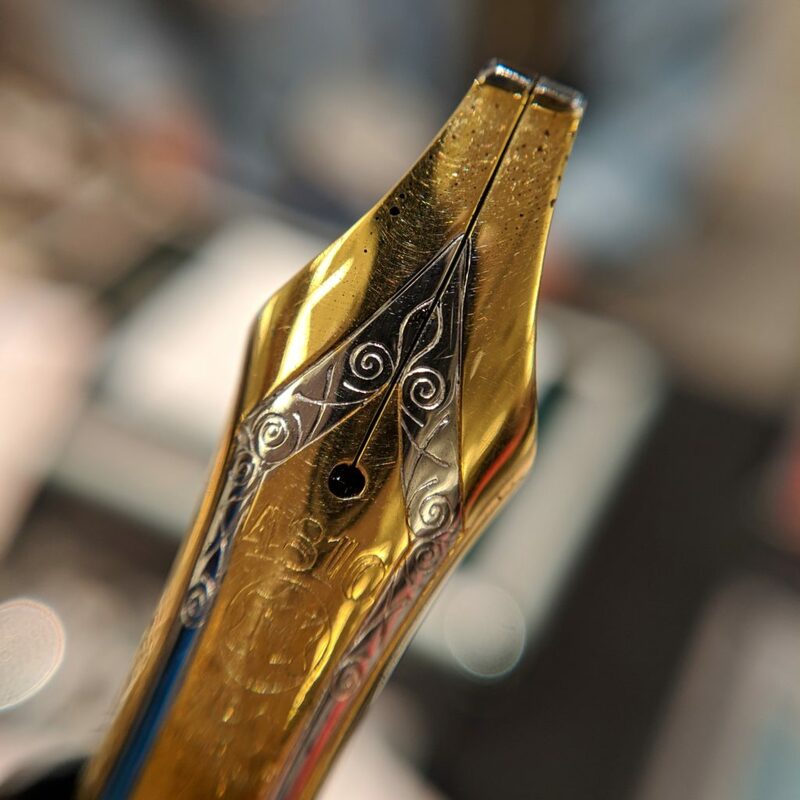 Pilot Custom (Broad Nib) – Here’s a vintage pen that’s always been on my list. I love the Pilot MYU Black Stripe but I found that posting and unposting wasn’t the best for work. Now this Custom Black Stripe is pretty much a perfect Every Day Carry pen for me. 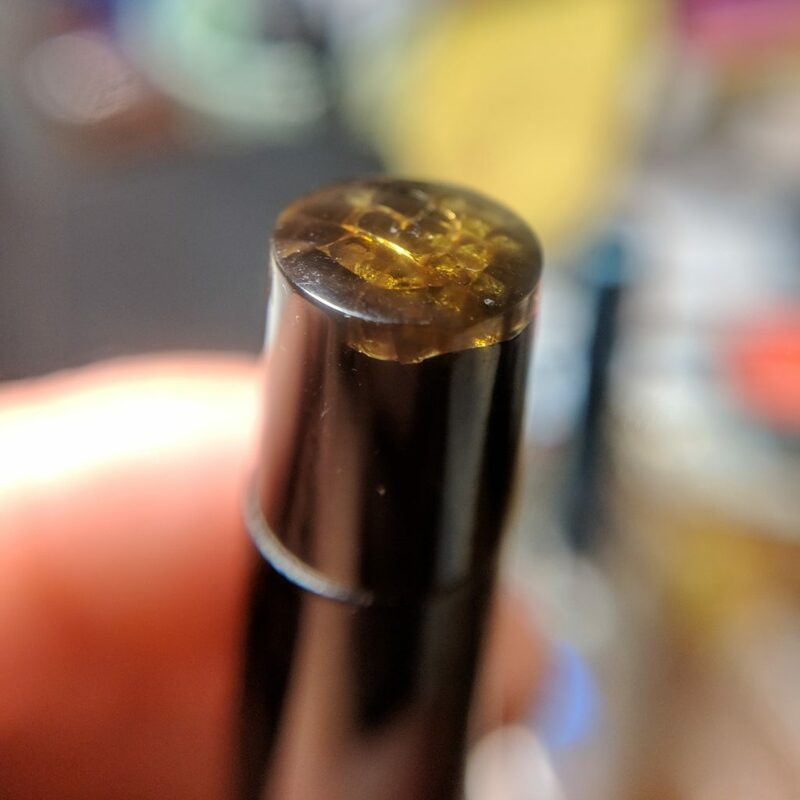 A snap-cap, smooth juicy nib, and a simple aesthetic. However, the biggest find for me in 2018 are my Pen Friends! 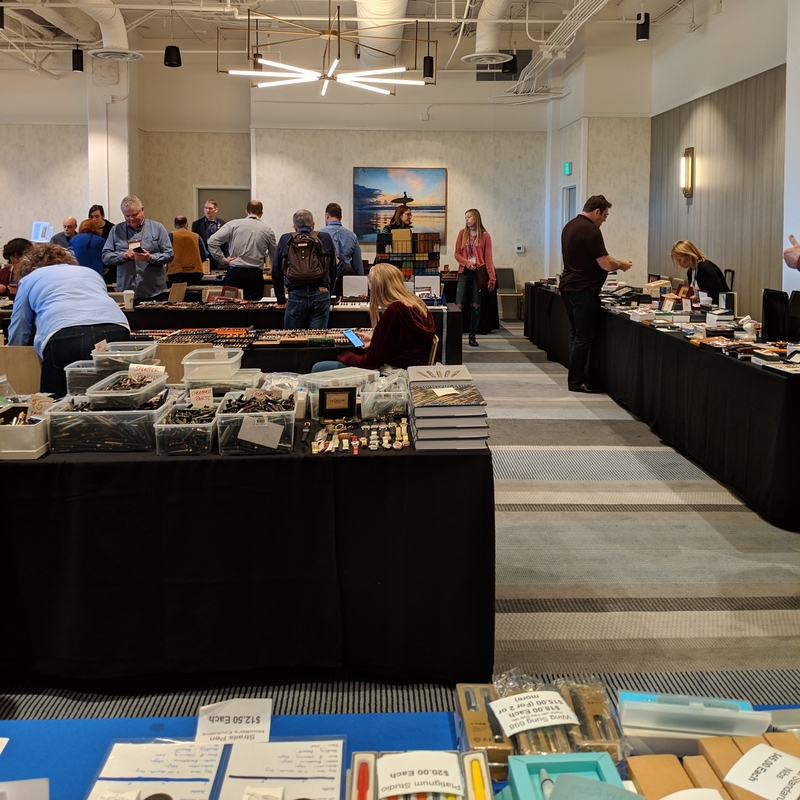 I was lucky enough to be able to once again attend both the San Francisco and Los Angeles pen shows and was able to meet new people either just from the show or via online. The San Francisco Bay Pen Posse pen group has also grown and I’ve met great people whom I see at least once a month. 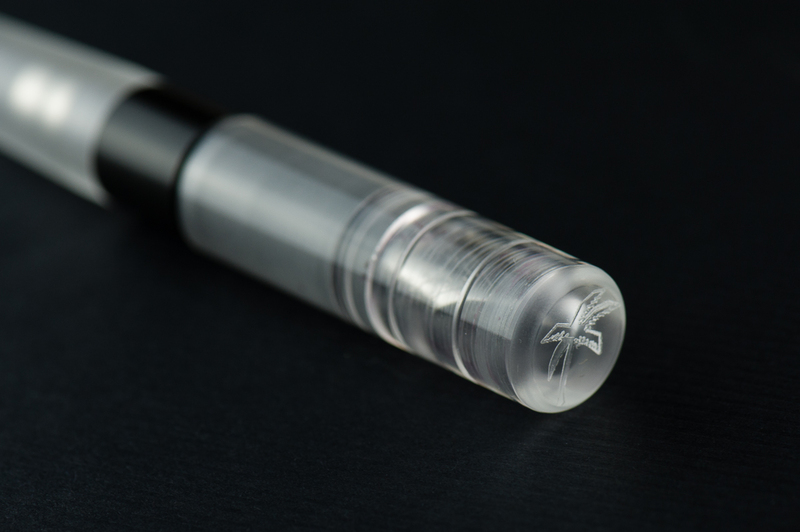 I really love that there is an active pen group that is local to me as it lets me talk to like-minded people in this hobby. So here’s to 2019 for more pen adventures, more learnings, and more fun! Thank you for your readership dear friends! 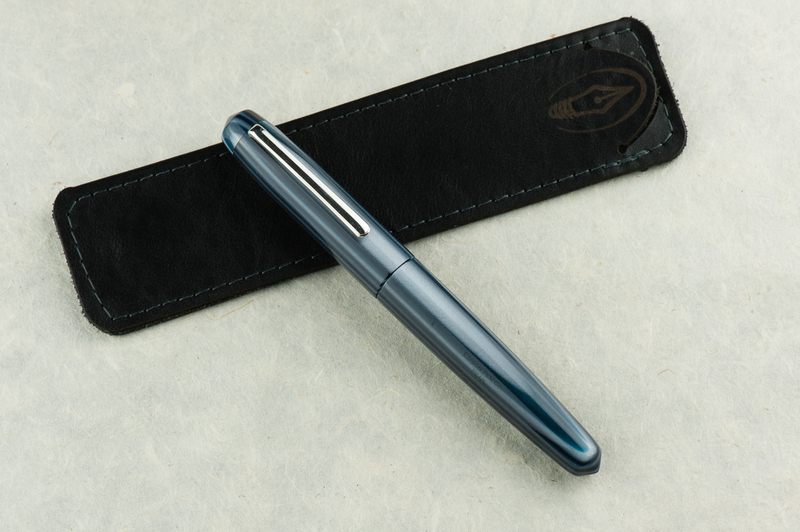 Katherine: It’s been a crazy year for me — both personally and in terms of pens. In 2018 I discovered a couple new brands and makers (a post about this to follow!) and hoarded acquired more pens than was probably responsible. Whoops. For my top 5 I’ve chosen a mix of both interesting and super-functional pens: Nakaya ao-tamenuri decapod mini, Japanese vintage (kamakura-bori), Nakaya heki-tamenuri dragon thingy, Parker 51 with ishime by Bokumondoh & Stylo Art Saiun-nuri. 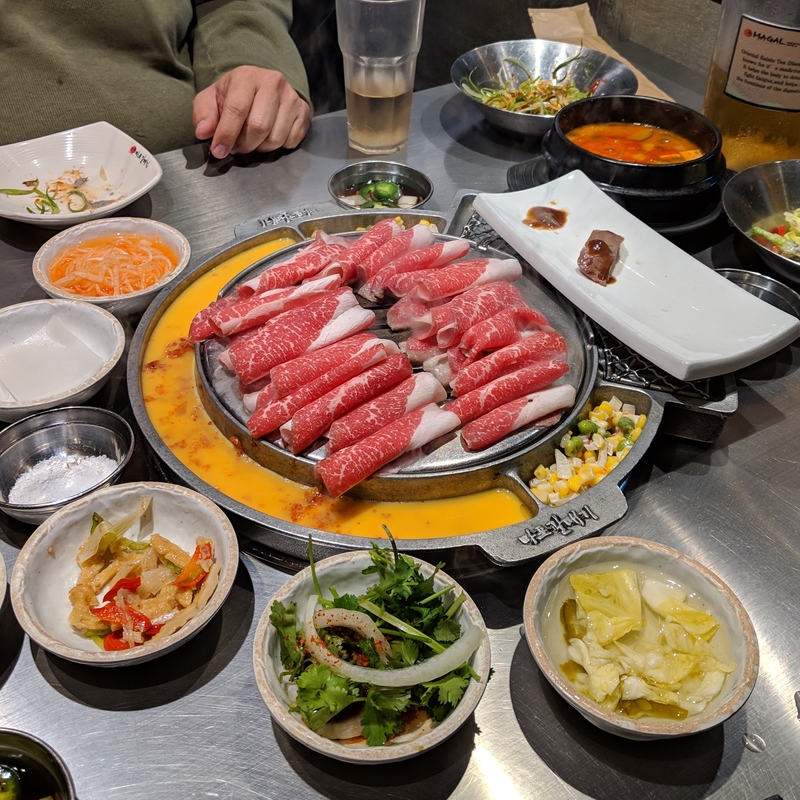 Pam: 2018 was a year of big changes for me, which included in less acquisitions (darn adulting!) and exploring what was already in my collection. 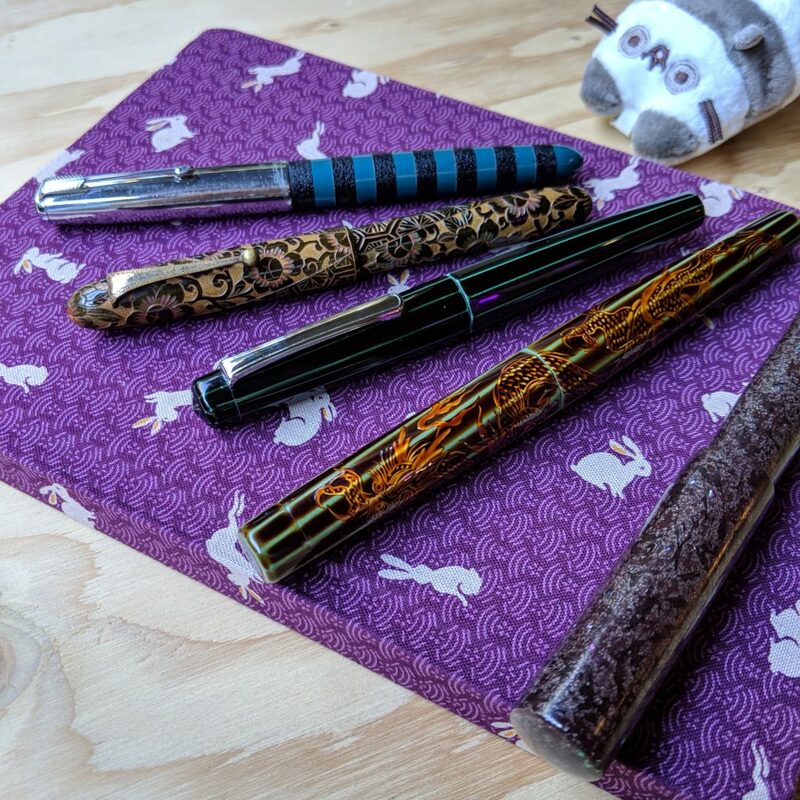 At least, that’s what my top 5 pens are reflecting to me as we wrap up 2018. 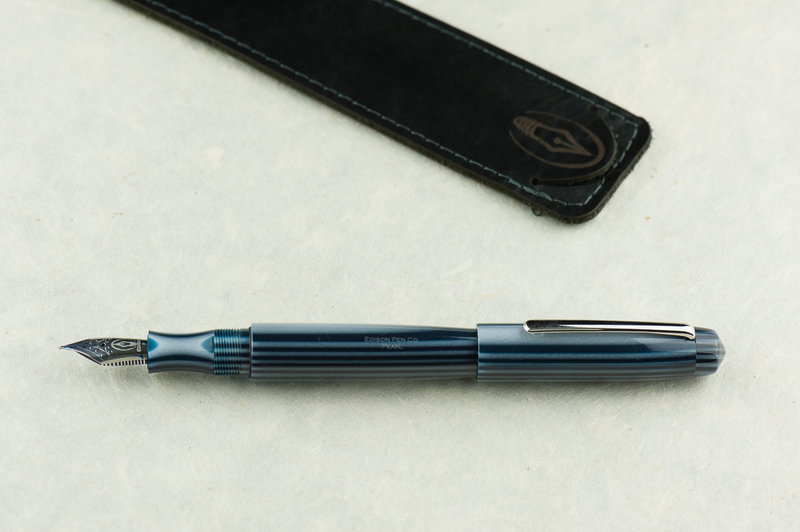 Lamy 2000, needlepoint grind by Mottishaw. An oldie but a goodie. You know you love a pen when you part with it only to buy it again. 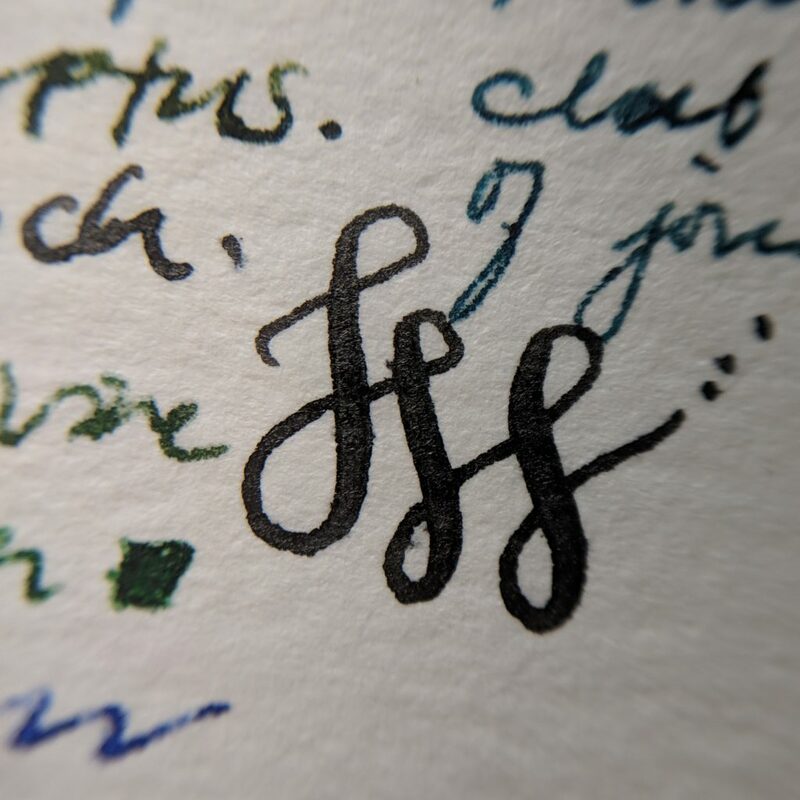 I parted with my original Lamy 2000 with the EF nib to a friend who loved it more than I did, only to miss it. 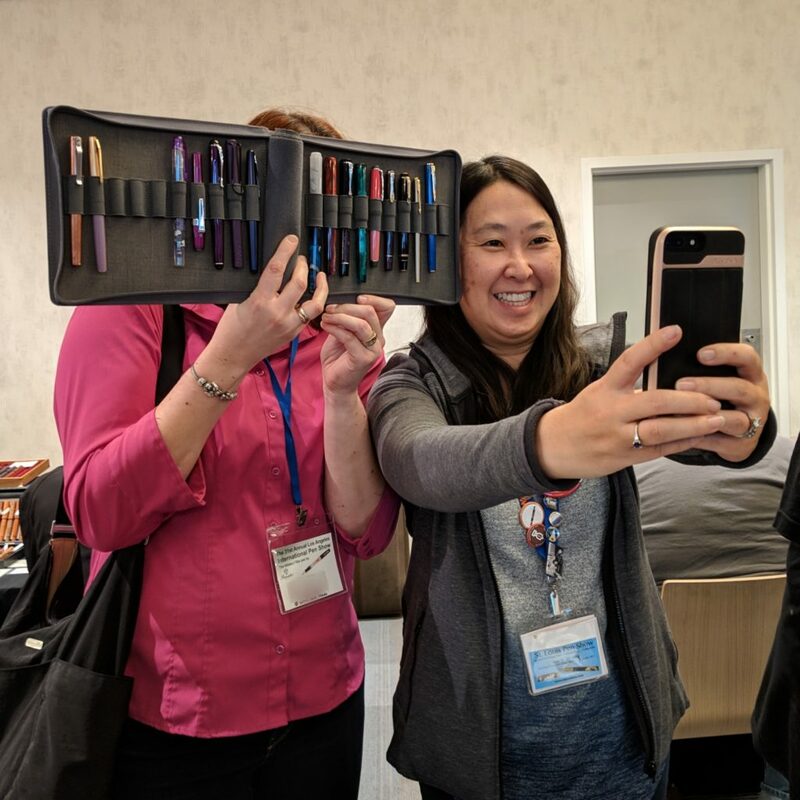 I was fortunate enough to find someone at the SF pen show who was willing to part with the needlepoint Lamy 2000 that I coveted since the 2017 SF pen show. It was fated! Yes, I absolutely inked it with Sailor Yama-dori. 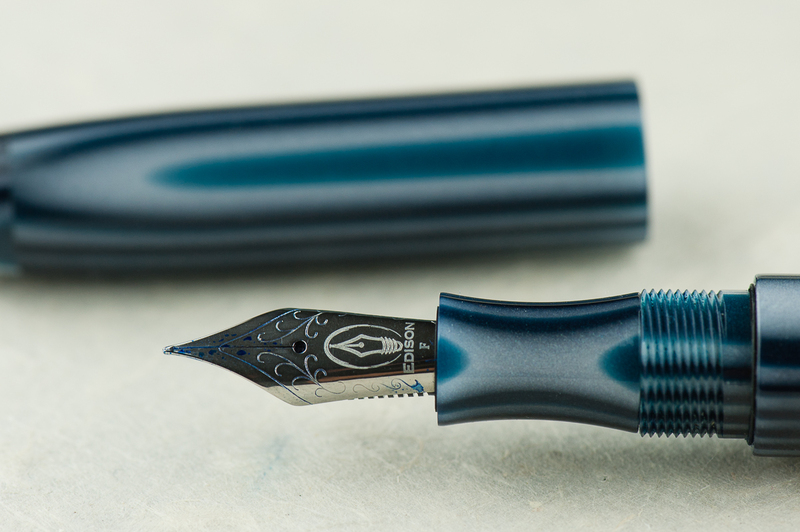 Sailor Blue Cosmos, MF nib is a bit of a surprise to me in terms of how much I enjoyed writing with the pen despite it’s broader, relatively speaking, nib size. 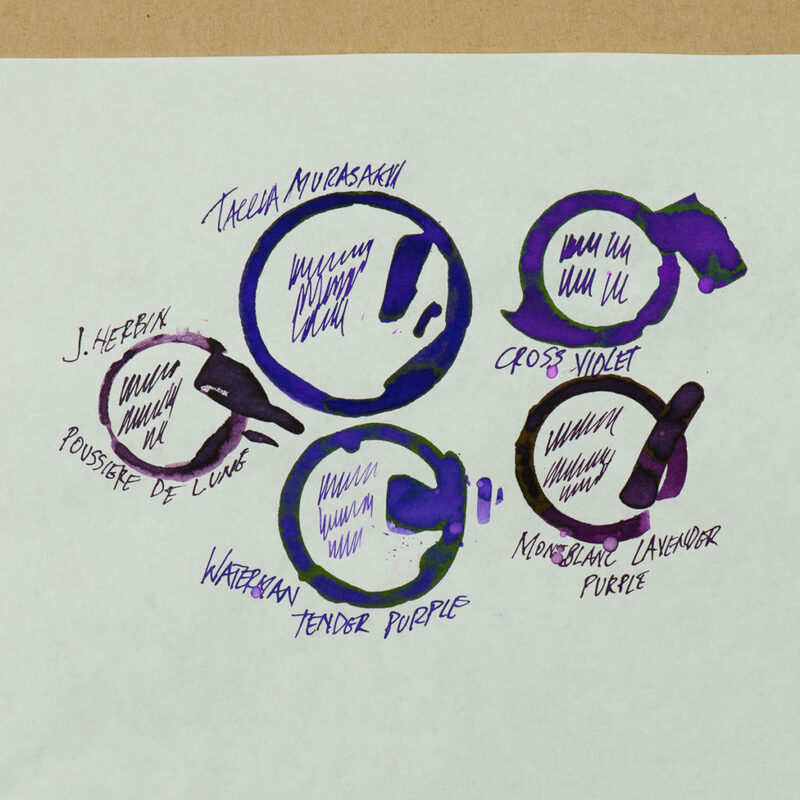 It is currently paired with my new blue obsession, Iroshizuku Tsuya-Kusa. I can’t get enough of this warm blue which reminds me of bright summer skies. 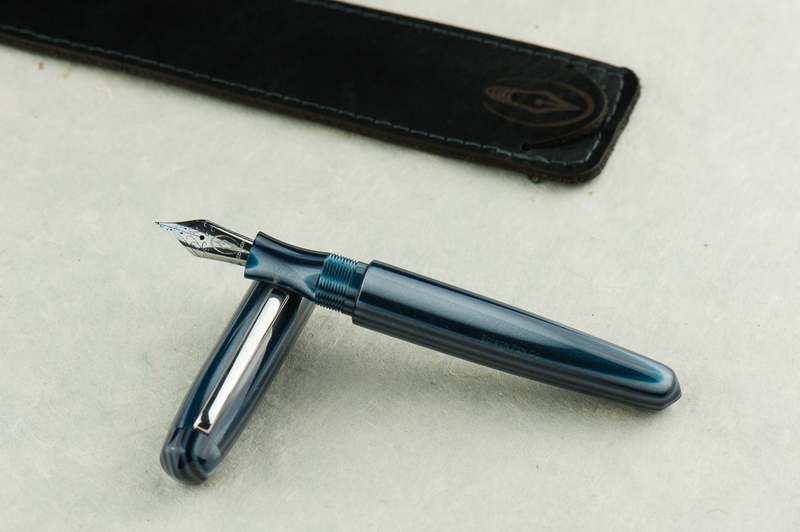 The MF nib shows off the color beautifully. 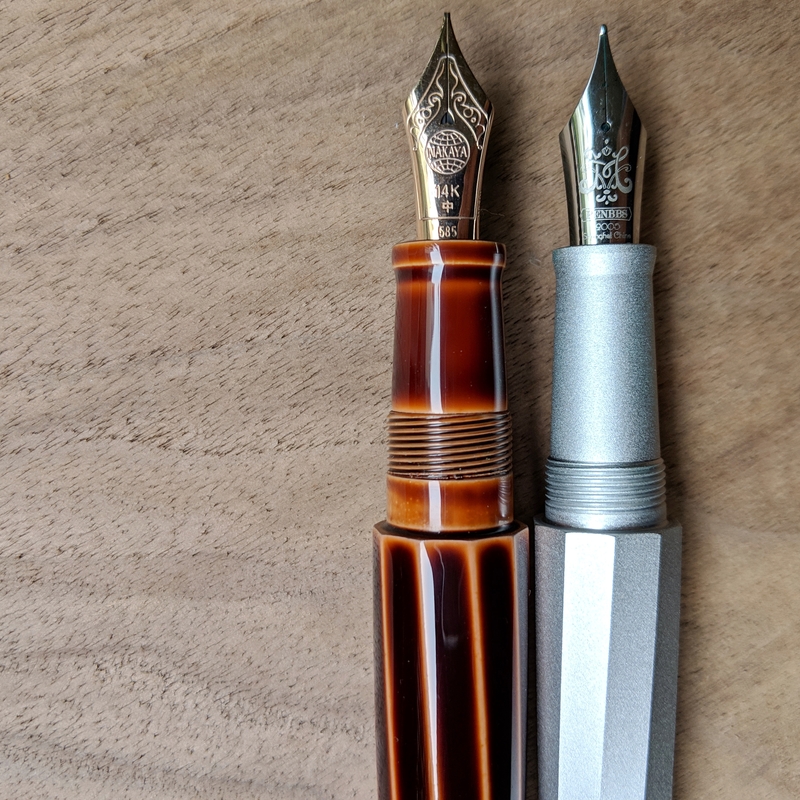 This is my favorite pen and ink pairing in 2018. 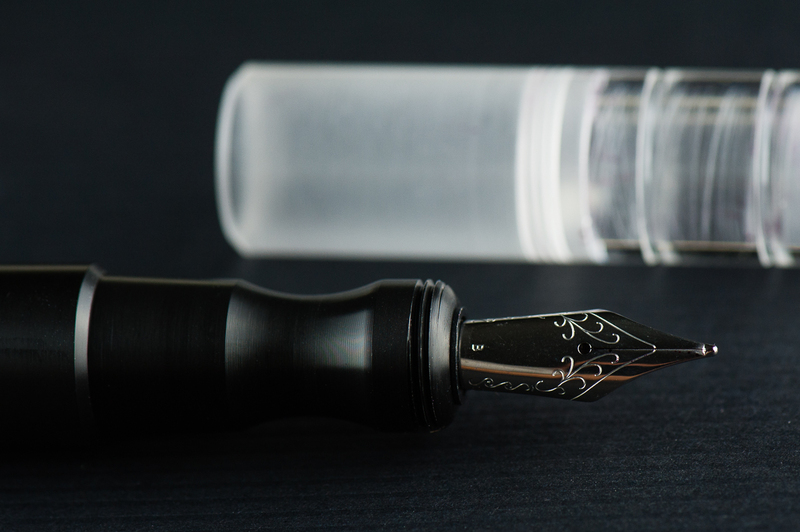 Platinum 3776, UEF nib was a gift by the infamous Thomas Hall who is also known for his tiny “hantwriting.” From one tiny handwriting person to another, I am so grateful for this pen. 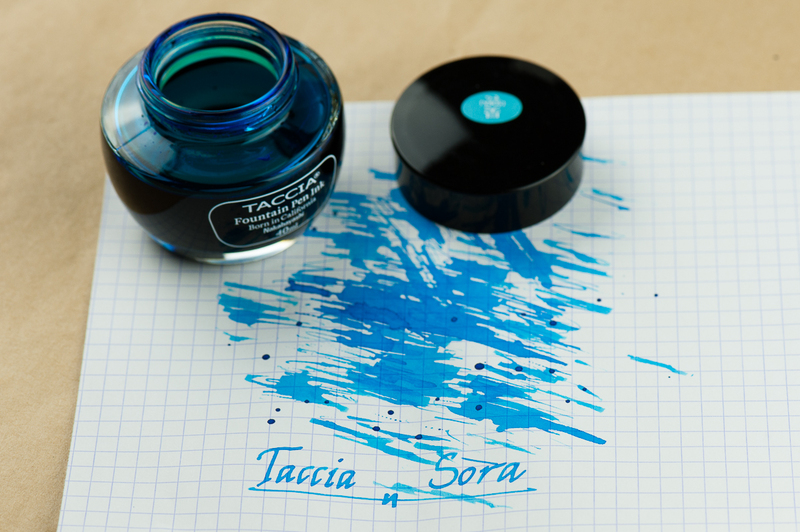 It has been inked with Pilot Blue Black, my ode to Thomas Hall himself. 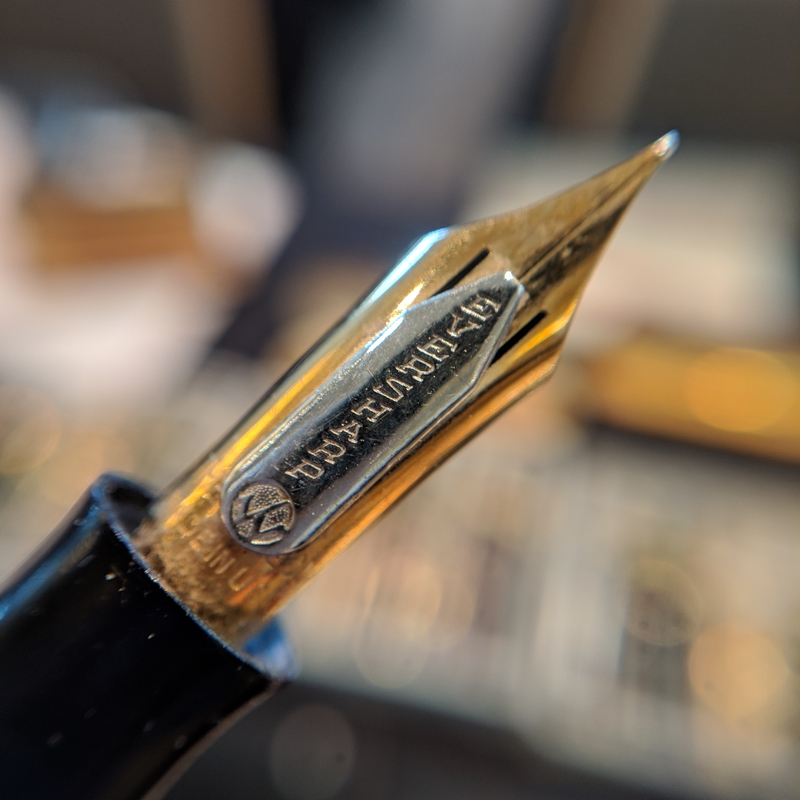 Platinum is a brand that I was introduced to through Katherine who has a bit of a Nakaya obsession and now, I definitely understand why so many love the Platinum nibs as much as they do. 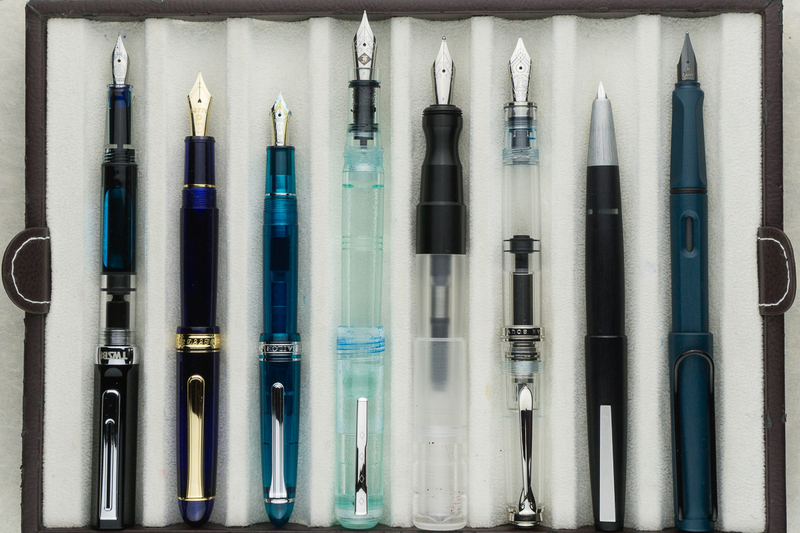 I greatly appreciate how different the nibs of the big 3 Japanese brands feel and how they distinguish themselves. I find that to be particularly true in the super fine and extra fine sized nibs. 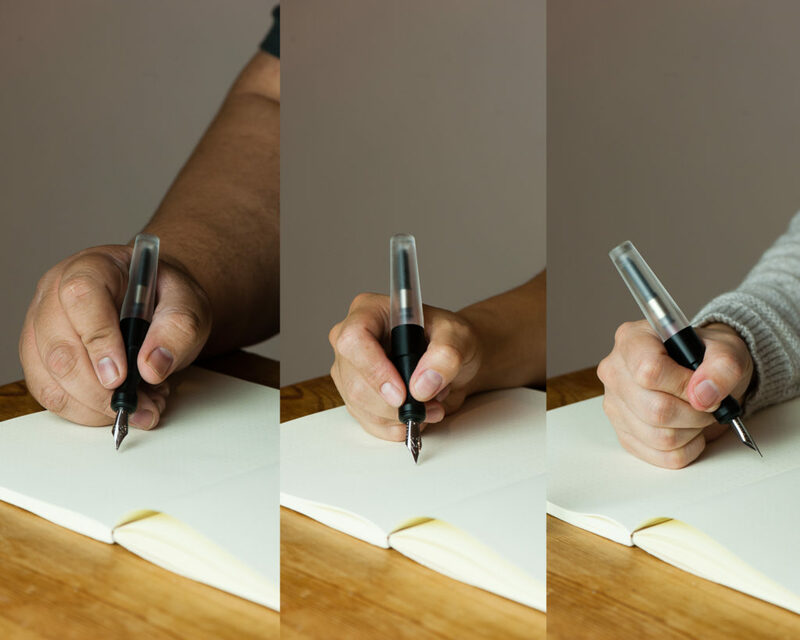 The difference may appear to be minute, but when nib hits the paper, it’s a whole new world. 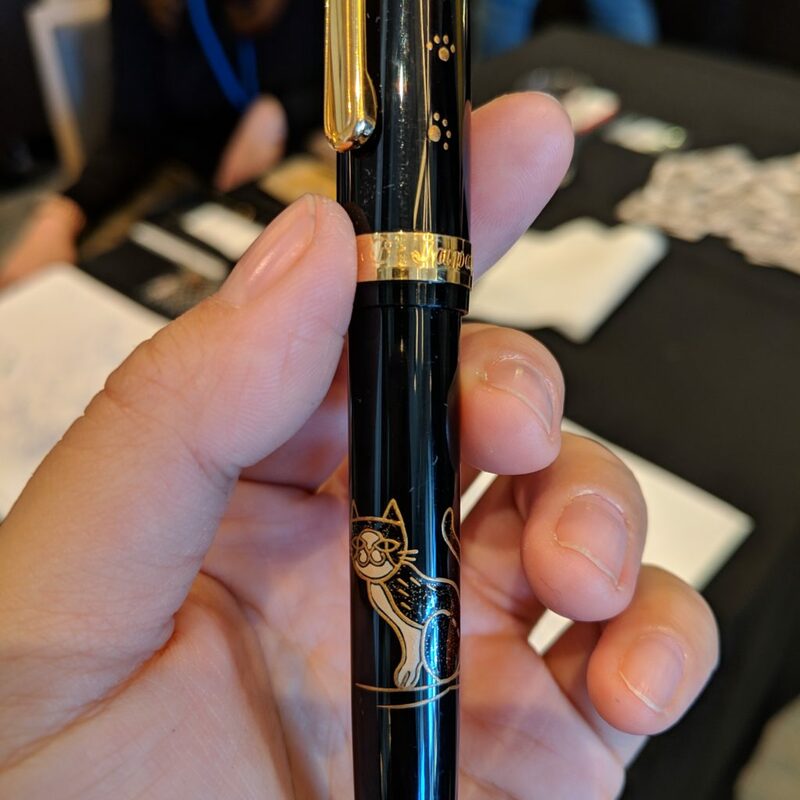 Brute Force Pequeno with Montblanc 144 nib became one of my favorite SF pen show memories this year and resulted in one of my favorite pens of 2018. 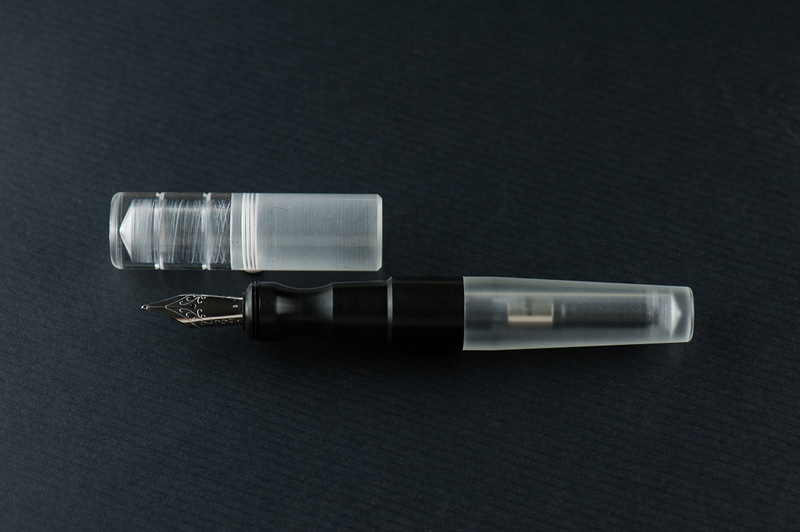 I loved the body of the Pequeno but found the standard nib to be lackluster. 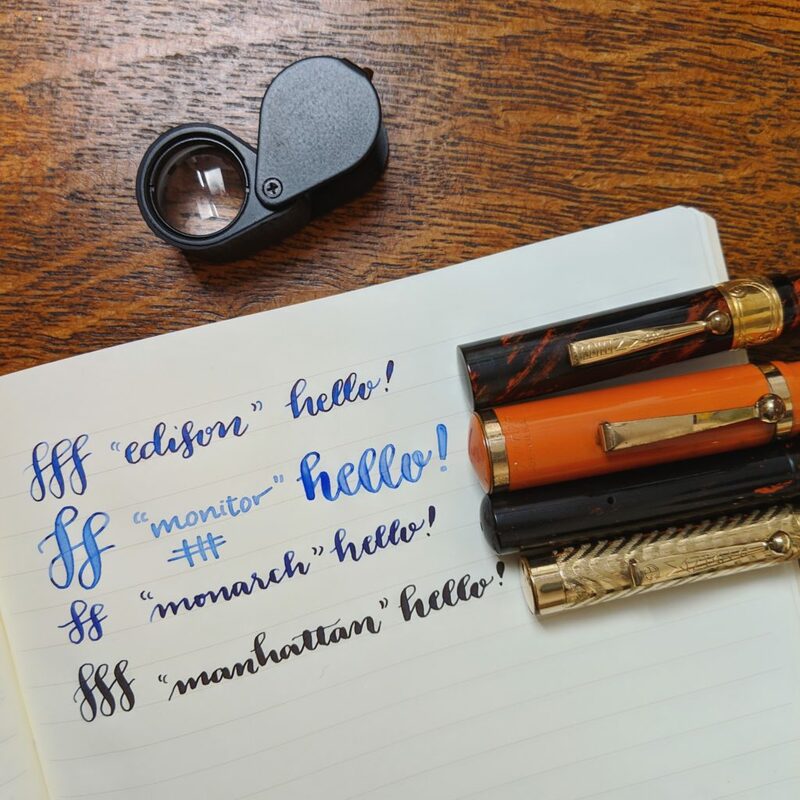 I really wanted to write with the Montblanc 144 nib more, but hated the skinny body. 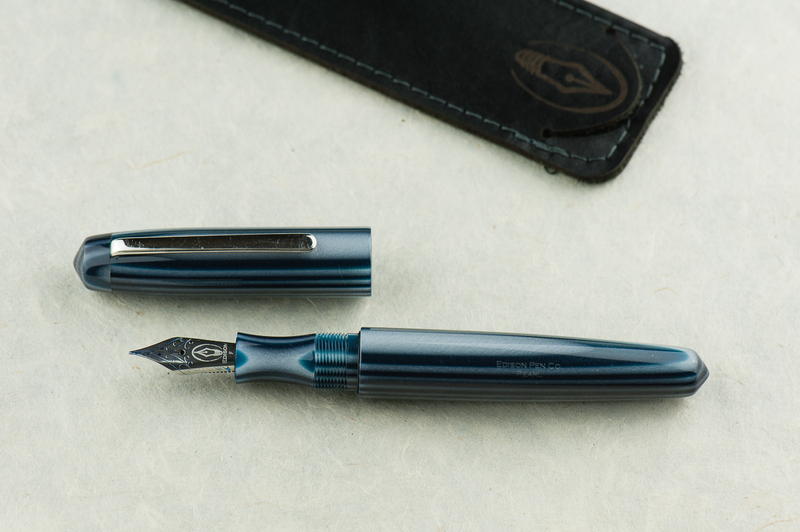 Claire came to my rescue by notifying me that the 144 nib would fit a Jowo housing if I could acquire one. 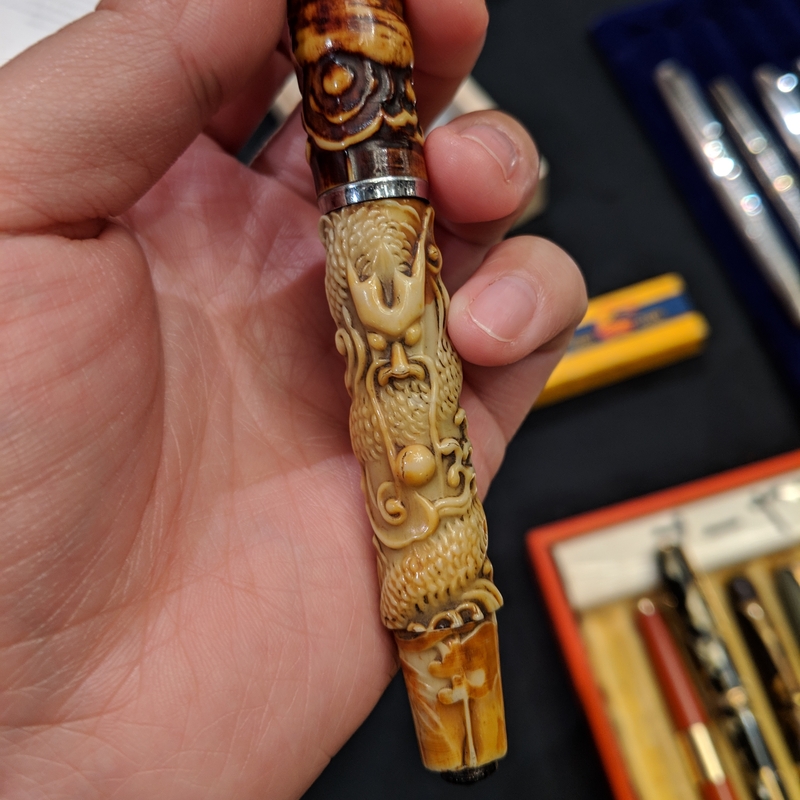 The hunt was on at the SF pen show! It resulted in trips down memory lane for both Troy and me as I showed him the new improved Pequeno. I paired with with Sailor Rikyu-cha because the broader, wetter Montblanc nib showed off the green-brown color so well. 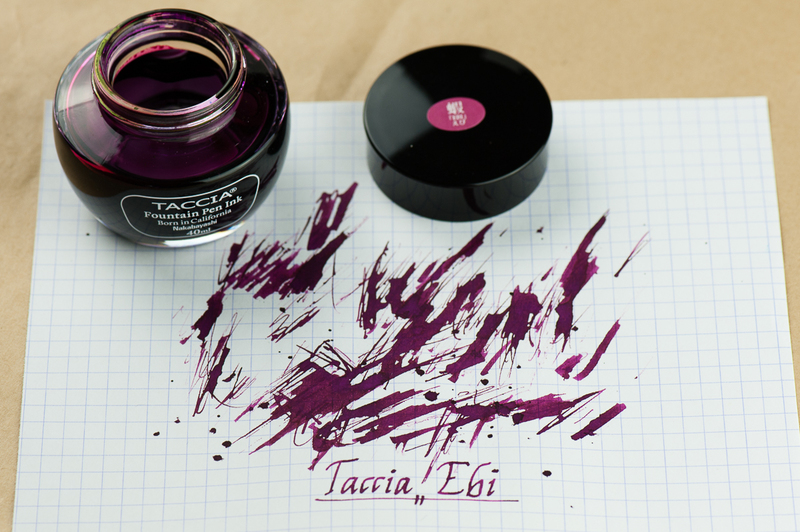 I am still intrigued and mesmerized with this ink color. 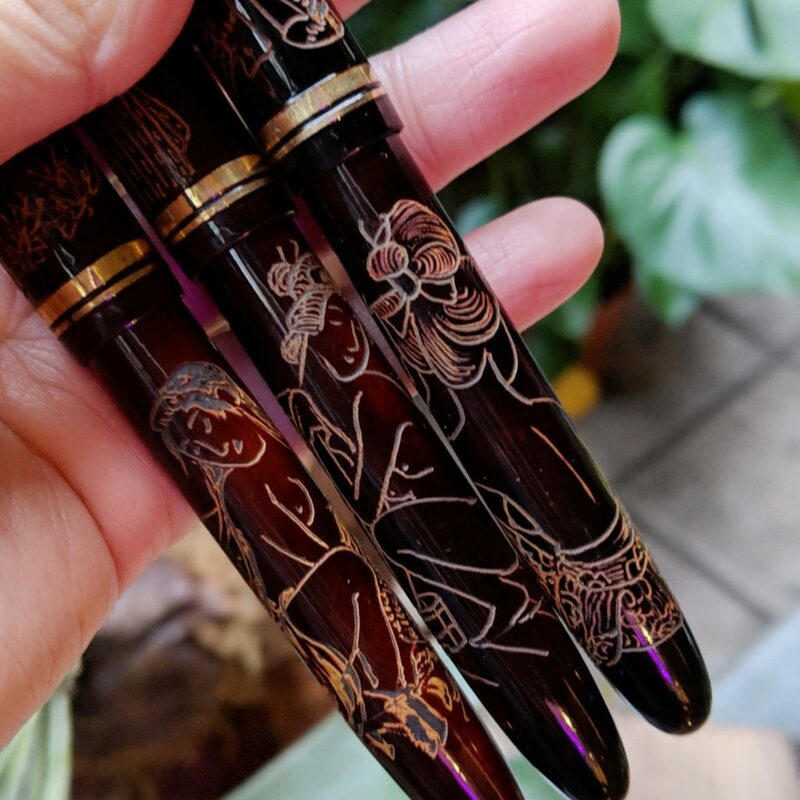 2018 was the year of me getting over the Sailor limited edition FOMO. It was a tough year for resisting temptation! 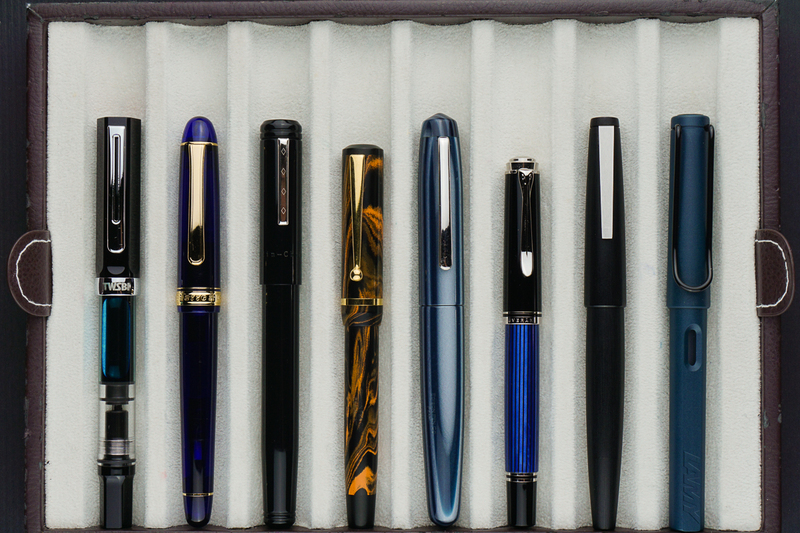 It also is making me reconsider parts of my collection that I don’t use out of fear of losing or damaging the pen, particularly when it comes to the vintage fountain pens. In 2019, we are going to fix that! I am going to start rotating in my vintage collection and continue to fine tune my collection. To more inky and pen adventures in the upcoming year! 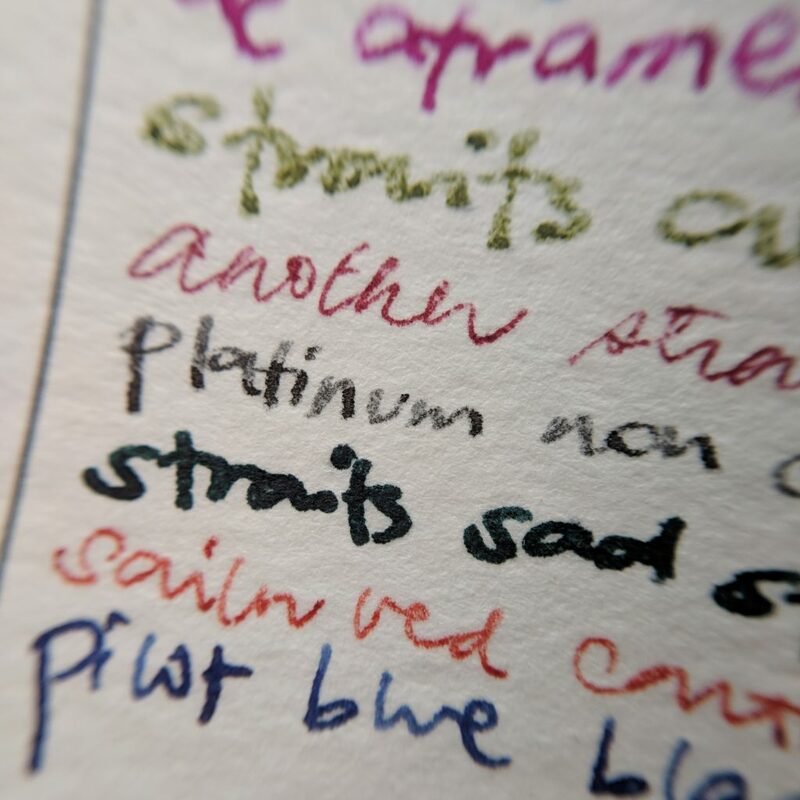 The paper seems to be coated, so many inks seem to sit on top of it, the exceptions are Pilot Blue Black (but feathered quite a bit when wet), Platinum Carbon Black (a little feathering, but much less) and Sailor inks, other than Sei-Boku. 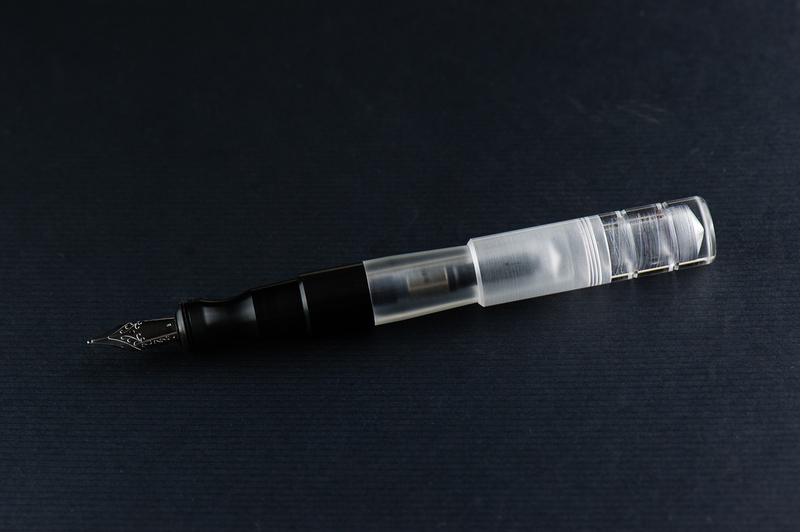 Wetter pens seem to saturate the paper enough to get through the coating, but some do feather. 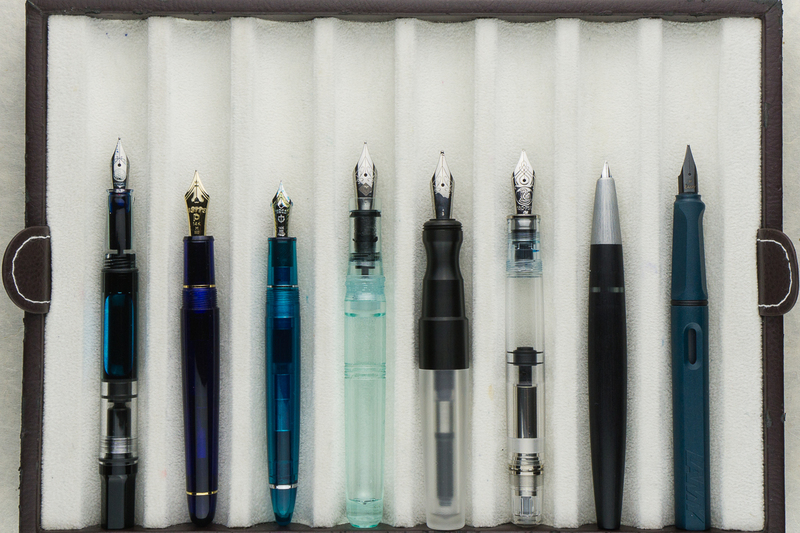 All in all, these aren’t fountain-pen friendly, but are tolerant if you’re willing to do a little experimentation and find a nib and ink that work for you. If you want to play it safe, Platinum Carbon Black delivers. Have you ordered from another online card printer? Want to do a guest post, let us know!